At JMYS we strive to enhance our reputation with everyone we do business with. Buyers have many choices and complex decisions to make. We focus on keeping the purchase process organized, friendly and fun. The strongest endorsement for our business is a happy customer and we work hard to exceed even the highest expectations. Buying a boat can be a complicated blend of emotions and logic and it is vital to select a broker who will not only be your advocate, but serve as a reliable partner throughout the entire purchase process and well after the closing. Often times many years go by from initial introductions to closing the deal. We never push and try to always be available. Regular communications with timely follow up and even stronger follow through are some of the traits that set us apart. We believe that trustworthy, ethical business practices along with solid product knowledge and on-the-water experience are essential characteristics of a professional yacht broker. The relationships we create with our customers most often evolve into lasting friendships. We educate and inform as we guide you along the way. Our favorite stage is the hands-on training with check lists and procedures that we provide to new owners in order to insure our clients are competent with systems operations and comfortable when they take off on their own. Thank you for coming to see me in Honolulu, I enjoyed meeting your wife Pam and spending time with both of you. It is very satisfying to have Lucky Duck over in the islands now and this would not have happened without your help. It has been a very unique journey working with you and I trace the beginning back to seeing your video of the Diesel Duck 382 Jubilee and giving you a call. I could tell when we first spoke that you were a broker who I could trust and someone who had the experience to help me find the right boat. I have always preferred steel boats (and you got to see my Tahitian Roamer steel sailboat now for sale during your visit in Hawaii), so when I missed out on Jubilee it was disappointing. But you listened and knew what I was looking for and then you found the larger 462 Lucky Duck for me to consider. It all happened pretty quickly and after we met in person for the first time in WA to inspect her, I knew she was the boat and you helped negotiate a fair deal. Our second trip to Port Townsend, WA for the survey, sea trial, haul out, etc. was very well organized and I could always tell that you were protecting my interests and focused on me understanding not only what I was getting in to, but also explaining many of the features and equipment so that I would be at ease when it was my turn to take command. After closing and fixing the items found during the survey, I was ready to get underway locally in the Northwest waters for some practice runs which included a trip up to Canada to visit my cousin. When we had everything ready for the homecoming passage to Oahu, my cousin and one other person joined me for our Pacific crossing. 19 days later we arrived in Hawaii and as we discussed during your visit, there were quite a few exciting episodes during the adventure. 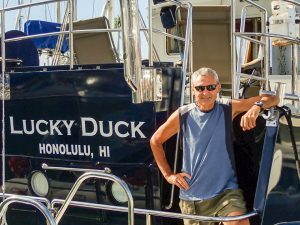 I always felt safe and secure aboard Lucky Duck, she is very well built and I now know she can handle anything the ocean offers. After getting her settled in her new marina, I am now having a great time with detail projects and thinking about some trips to the neighboring islands. Jeff, you are now a good friend and I appreciate everything you have done to help me make this all happen. You and Pam are welcome to join me on Lucky Duck any time – please come back soon. We are writing to let you know how good we feel to count you as a friend and to thank you for your help over the years in the Nordhavn world. It seems that it wasn’t that long ago that we asked you to list our beloved Nordhavn 46 Storm Haven for sale and you quickly were able to find a couple to buy her who we know will take care of her and enjoy her like we did. The search for the next Storm Haven involved spending time with you on a trip to Canada, a visit to Florida plus many phone calls and emails. During that time we have learned more about you and you have become much more than a yacht broker to us. You have a terrific and detailed approach to evaluating boats and really listened to understand what we were looking for so we could make the best decision. 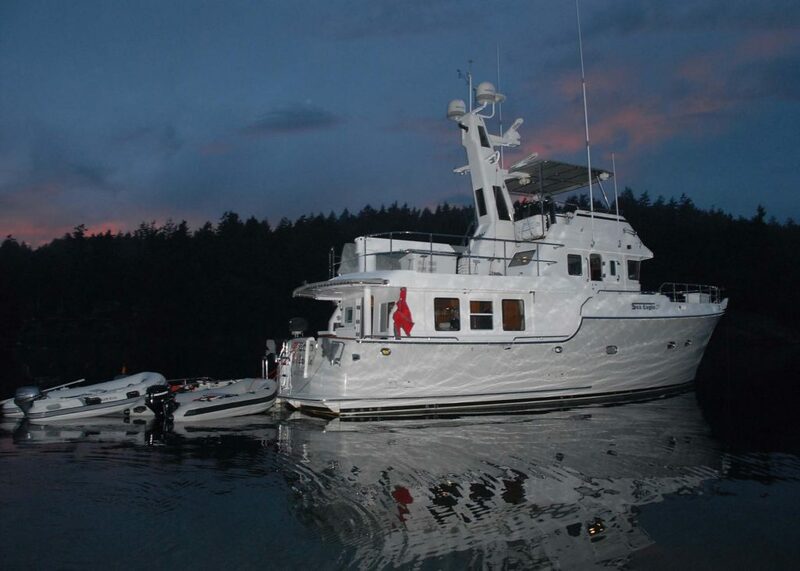 Happily, this led to you organizing the successful purchase of our new Nordhavn 57 Storm Haven up in Washington. 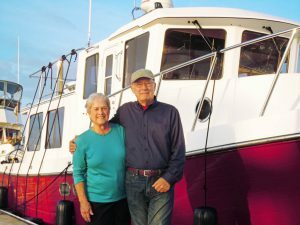 Not only did you help us buy our wonderful 57, you have spent time after the sale to make sure we are comfortable and easily making the transition to a much larger trawler. We are happy that we could make Storm Haven available so that you could film your Physics of Docking training videos and look forward to watching each new episode. Jeff, thanks again for your support and friendship. Please know that you and Pam are welcome aboard anytime and we hope to see you both again soon. My wife and I had a 3 to 4 year plan to buy a trawler and move onboard. I called Jeff about his Selene 55 listing and I told him that we were quite a way out. He was still willing to work with us saying that it takes time to figure out what is best. From our experience, most sales guys would just blow you off and move on to the next quick sale instead. After seeing Bella Luna things have suddenly changed. Stars started to line up for us and our long-term plan turned into a 3 – 4 month plan instead. We told Jeff that we had fallen in love with Bella Luna, but he told us that we weren’t allowed to fall in love with the first trawler we saw. So, he sent us off to Seattle (he couldn’t attend) and made appointments for us to look at more trawlers. Again, what sales guy does that? Most would say great, lets write up an offer now. Jeff coordinated with the other brokers as our representative (almost all of them know Jeff – he’s well connected). 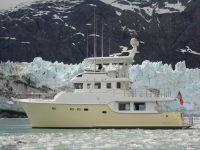 After spending time aboard a dozen or so trawlers, debriefing with Jeff to share what we learned, we were very certain that yes, the first boat, the Selene 55, was in fact the right boat. 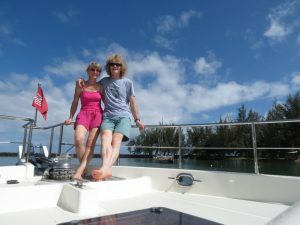 Deanna even set up a charter with the seller to see what it is like to be on a Selene 55 underway and that was the clincher! Another interesting aspect of buying Bella Luna is that we also purchased the charter business which remains very popular and keeps us busy! Jeff is not your typical sales guy. His reputation means more than anything to him. 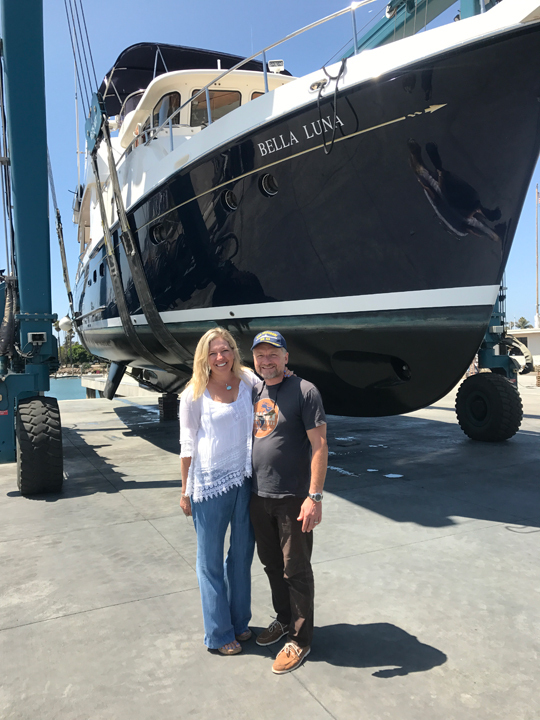 Bella Luna is the very first boat or trawler that we have ever owned so making one of the biggest financial decisions in our life was a huge thing. Jeff’s low-pressure approach put us at ease. Always approachable, always available to talk and always a wealth of information on anything about trawlers. As the listing broker he represented both us and the seller, not an easy task, but one he did with professionalism working hard with everyone’s best interests in mind. At closing, Jeff told us to jump right in and enjoy the boat and to call or email if we ever have a question. He also suggested that after a couple of weeks or months we set aside some time for him to come spend time aboard to provide training on any topic we wanted to improve. We finally set that up four months after the purchase. Jeff came and spent a weekend with us anchored out at the islands. Training, going over all the systems on board and making sure that we felt comfortable with everything. It felt good that my wife and I could handle it all by ourselves. 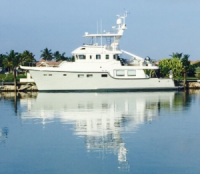 If you are buying or selling a trawler Jeff Merrill is your guy. His expertise and his character make all the difference. You will not be disappointed! If you are reading this testimonial, you have need to look no further. Give Jeff a call. All of my previous boats have had sails. The thought of an uncluttered deck, and constantly having to adjust the sails sounded promising. As fate would have it, I developed a neuropathy in my left hand that would have made sailing impossible due to the limited use. You might say the decision was made for me. After about six months of researching various vessels. Decision made. My wife Sandy and I set out to find a trawler. Again, I was a sailor, 7-8 knots was fine with me. After all, the destination is only a small part of the journey. The best part is getting there. We desired a boat that was safe, comfortable, and economical to operate. Jeff had a 39′ Kadey Krogen listed on his web site, gave him a call, and the rest is now history. As I was to find out later, Jeff truly is the “trawler expert”. Jeff is very keen on details, communicates well, and more importantly always has a plan B. Buying a boat can be bit like herding cats if contingency plans are not considered. He was present during the haul out, survey, and the sea trial. 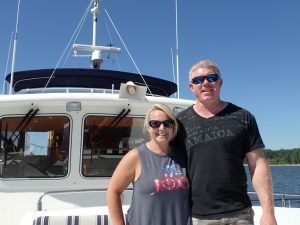 As an additional bonus, Jeff flew in Christopher Bruce, a Kadey Krogen owner/ business associate from the East Coast (my boat was purchased in CA.) to answer any and all questions that I had. I felt that I had a good support team. Christopher is a great guy, always happy to assist. Both he and Jeff are still only a phone call away. The customer service continues after the transaction has been completed. 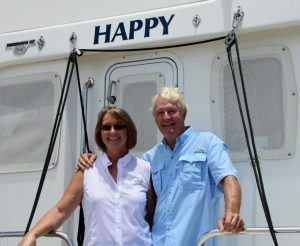 I was pleasantly surprised when I was contacted by Jeff a couple of weeks after we had purchased the boat. He flew up to the Bay area to come give us some training, and explore the multiple systems on the boat. For any first-time buyer, these efforts are priceless. We spent a day on boat handling procedures, the next day on the boats systems. With blue tape and a “Sharpie” pen, Jeff proceeded to label just about everything. Plumbing, electrical, and everything else that could be of question. Don’t let his slacks and Hawaiian shirt fool you. This guy is willing to get down and dirty. It did not stop there. He also took photos of what he had just labeled, then downloaded to a memory stick for future reference. Jeff also supplied me with check lists, and a binder that he had printed for important, but easy to forget documentation regarding the vessel and required documentation. Without his help, I am pretty sure that I would be helping to fund the Coast Guard fleet. Whether you are a buyer or seller, I highly recommend JMYS and his professional team of experts. 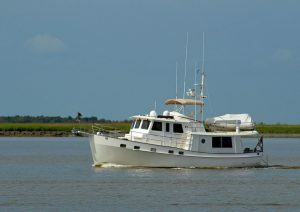 We bought our Nordhavn 55 (5507) through JMYS earlier this year. We have known Jeff for many years and even though Jeff was our initial contact, we also had met with Ray to see boats and talk about Nordhavns. Since this was a JMYS listing, when we made our offer through Jeff, he and Ray divided duties with Jeff representing us on the buy-side and Ray representing the seller. It was very transparent and professional, they work well together and we were always informed. Jeff guided us through the surveyor and diesel mechanic selection and both brokers attended survey and haul out. Their network of connections for the entire process was extremely helpful – documentation, surveyors, haul out yard, insurance, etc. The transaction was straightforward, well documented and explained and painless. The purchase process was very well organized. After acquiring the boat Jeff and Ray each spent time with us on different occasions doing all sorts of training including basic familiarization with the boat, getting us signed up for the Nordhavn Owners Group, organizing the registration paper work, preparing for a coast guard stop, detailed familiarization with all of the various systems on the boat and hands on docking, anchoring and navigating. Ray, living local, spent several days with us, including one-on-one boat handling with Julia and we also practiced docking. 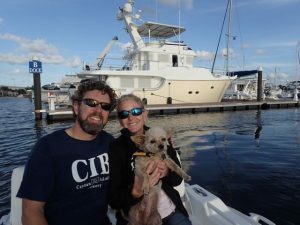 Jeff and his wife, Pam, flew out for a couple of days with us to do our first offshore traveling on Vamos and we also did some running in the ICW, getting us familiar with running underway. All told we spent about 40 hours of training. Now that we are about a month into our first real trip (Florida to Nova Scotia) the training has really paid off. The training reduced stress over so many aspects of our travels and has resulted in a far better experience than we would have expected. We are extremely happy with or Nordhavn 55 purchase and would recommend Jeff and Ray to anyone considering buying a trawler (especially a Nordhavn) without hesitation. 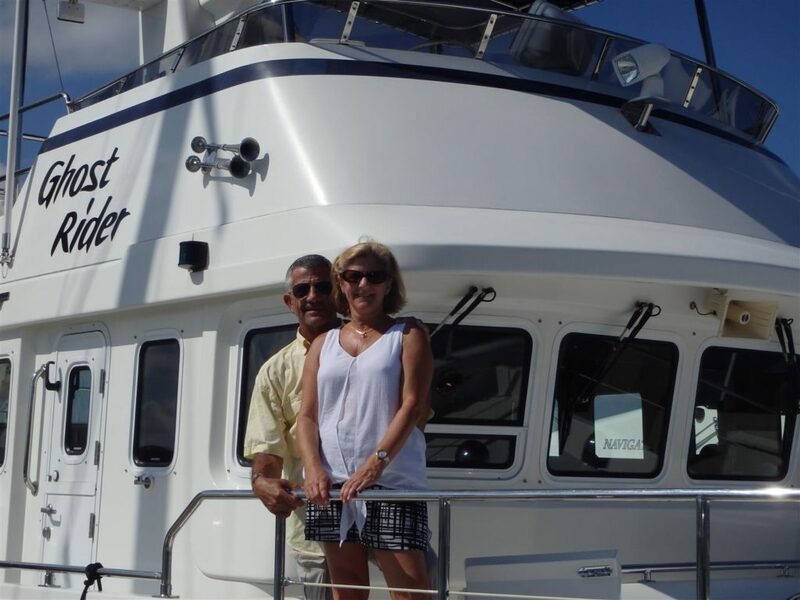 It all started with a dream of cruising in our very own Trawler Yacht. When we decided to make it a reality we soon realized that this would be a very complex process and we needed someone with extensive knowledge and experience to help guide us through the process. We met up with a few brokers and expressed our desire to have someone act on our behalf as a “buyers broker” and after each meeting we left feeling as though they did not listen to what we wanted or were more interested in selling us something before we were ready. Upon more research, we kept seeing the name “Jeff Merrill”. He was even mentioned positively on someone’s blog so we decided to take a look at his website and see what he was about. We were very impressed with what we saw and the honesty of what boat ownership and the search for the right one is all about. We were going to be in Jeff’s home area on a Business trip so we set up a lunch meeting on relatively short notice and Jeff was able to oblige. We ended up talking for nearly three hours receiving more helpful guidance and information in that meeting than we had received anywhere else. We were impressed and relieved feeling that we had finally found someone who understood what we needed and where we were in the process. Needless to say, we “hired” Jeff that day. Jeff went to work right away. He contacted past clients in our area and arranged for us to meet with them and learn from their experiences in the process. 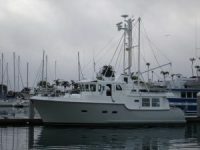 He encouraged us to look at as many trawlers as possible before becoming too attached to a style and would set up meetings with listing brokers to see boats that interested us. Although he was extremely busy, he was very responsive and took the time to talk nearly every day and coach us. Jeff was our voice of reason when we thought the second boat we toured was the perfect one. He never wanted us to lose out on the perfect boat, but wanted to be sure we had done all our homework and could feel absolutely confident that we were choosing the right boat for us. After looking at quite a few boats, we finally found the one! 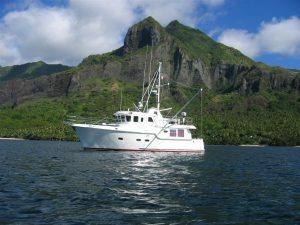 A 53’ Selene Trawler. Jeff looked after us and our best interest the whole way. There were several hitches in the purchase process once we had made an offer (none created by Jeff!) however Jeff was able to easily navigate those situations and counsel us on what course of action to take. It was very important to him to make sure we were happy with our decision during and after the sale. He was there every step of the way! After everything had settled and we had our boat delivered to her home port Jeff scheduled a 3-day trip with his wife Pam to our home marina. This visit was to provide additional training on the use and care of our trawler, and was very valuable to us providing a great deal on how to operate her more smoothly and safely. We also had a lot of fun that weekend just hanging out with Jeff and Pam, what a great couple! 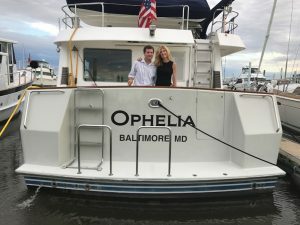 Now that we have “Ophelia” safely home at the Lighthouse Point marina in Baltimore, Maryland I am inspired to write a short note to thank you for all of your guidance in helping us fulfill our long-time goal of becoming Nordhavn owners. First, thanks for flying back to Florida from California after the closing and yard projects were completed to crew on the northbound trip from West Palm Beach to Morehead City, NC. There are a lot of new systems and equipment to understand (this Nordhavn 50 is much more complicated than our Grand Banks 42) and to have you on board for the maiden voyage (51 hours nonstop including my first two overnighters) has given me much more confidence! You have a very calm and easy way of explaining things and as a result of our time together underway I feel much better qualified to be the owner/operator/captain and the details we covered are still sinking in. Which is much more comforting than us sinking!! When you spend time at sea with someone you get to know them better – especially 70 – 90 miles offshore with no connectivity (no email or calls, it was a great escape). It was a blast talking about the boat, doing engine room checks, eating, studying systems, reviewing the electrical and navigation in the pilothouse, discussing weather and music. Before I forget, please send me your list of favorite bands and I’ll email you a copy of The Hollow Hill band CD that I recorded with my group. I know that “timing is everything” is an overused expression, but it sums things up succinctly to describe this purchase. It was my good fortune to check in with you shortly after you listed Nordhavn 50 hull 25 “Flat Earth” and before you were ready to put her on the internet. I’ll never forget me describing how I had just missed out on another 50 and telling you my wish list, and then the surprise when you told me you had a new listing that just might be a great fit – it couldn’t have turned out any better. 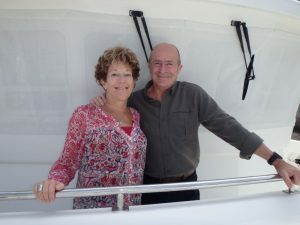 Once Missy and I flew down to Stuart, Florida and stepped aboard, buying and owning the 50 was all we talked about and we continue to be buzzed with enthusiasm. I’d like to complement you and Ray Danet for your professionalism throughout the purchase process. I’ve met many brokers, but feel like this was a much-improved experience having your extensive product knowledge and detailed organizational skills. With the offer accepted, we had to accomplish a lot of things in a short time, yet we always felt that we were your number one priority through your excellent communication and step by step approach (even though we knew you were being pulled in many directions). Buying a Nordhavn 50 from the original owner and getting to spend time with Phil Eslinger was an absolute bonus. Hearing why he made the new build decisions he did and learning his thinking really helped us better understand the boat. I know many brokers don’t like the buyer and seller to meet, yet you not only introduced us, you encouraged us to talk and the unique relationship this created made for a virtually seamless ownership transition and as a result we each have a new friend. It feels good for us to know that Phil realizes his “baby” has gone to a good home. Regarding your training…yes, I will buy a label maker and update all of the blue tape and Sharpie reminder notes you have plastered all over “Ophelia”. Thanks, you know I am a by-the-book checklist type of person and love this stuff. When you told me that training would start during the survey process I didn’t know what you meant, but now I can appreciate your attention to detail and certainly have a much greater understanding of so many aspects that would have taken me a long time to figure out on my own. 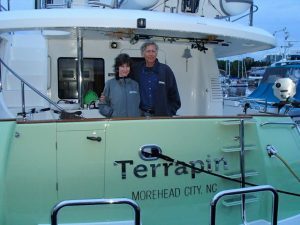 Missy and I look forward to touring “Ophelia” around the Chesapeake this summer and then hope to venture further as time allows. If any of your future clients want to speak with a more than satisfied JMYS customer please know I am a big fan and would be more than happy to connect with them. I know that even though this is a done-deal, that you view this as the start, not the end of our friendship. Expect me to continue pestering you with texts calls and emails and please also know that if you ever have the time you are welcome to join us for an excursion on “Ophelia”. Since that voyage, I broadened my personal research interest to include long-range cruising. I studied the obligatory Beebe/Umstot Voyaging under Power, and George Buehler’s The Troller Yacht Book. I read numerous other books and magazines on seamanship, navigation, charting, radar, marine weather, marine diesel, navigation regulations, and the liveaboard lifestyle. I evaluated characteristics and reputation of the major brands, e.g., Nordhavn, Kadey Krogen, Diesel Duck, DeFever, Fleming, etc. However as a lifelong experimentalist I understand that when the time comes to transition from theory to practice, the value of actual hands-on experience is crucial. 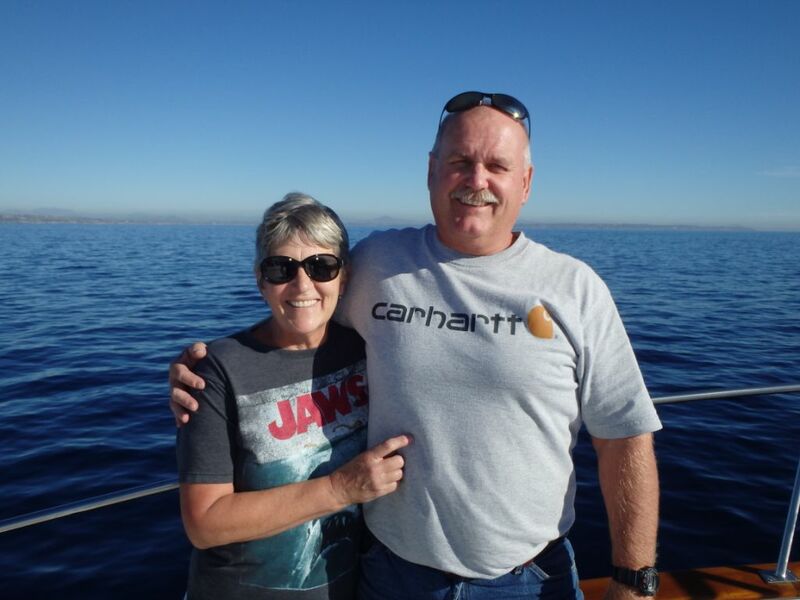 Based on exploring backgrounds and soliciting information form recent trawler customers and Southern California marine professionals, it was obvious that Jeff Merrill possessed the necessary credentials to provide that hands-on experience. After several discussions and meeting with Jeff, my wife and I concluded that Jeff not only possessed the desired credentials but indicated a real interest in assisting us explore the many trawler choices and eventually make an appropriate decision. We consequently ask Jeff to act as our broker. As should be expected from any broker, Jeff managed the negotiation and purchase process flawlessly. However our choice of Jeff was based on a desire for competent assistance during trawler selection. And as his credentials suggested, Jeff’s knowledge of trawlers and ship’s systems was instrumental over the lengthy exploration process during which our initial assumptions evolved significantly. My wife appreciated the fact that he was equally sensitive to her concerns and showed no interest in rushing the process. 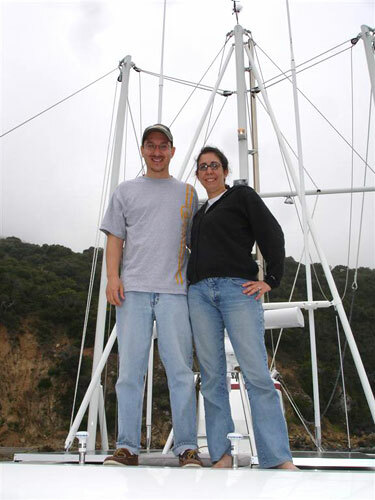 Over a six month period Jeff assisted us inspecting trawlers from San Diego, CA to Anacortes, WA. This knowledge and experience subsequently allowed realistic comparisons between separate brands and individual boats equipped differently. He provided both a template for vessel comparisons and the rough estimates for retrofit cost to add the desired equipment, which proved reasonably accurate for the Selene 53 we eventually purchased. 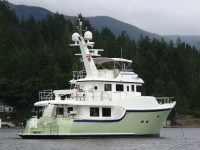 We have had the Selene for six months and continue to be satisfied with our choice of trawler and with Jeff’s assistance in its acquisition. I look forward to once again experiencing voyaging over tropical seas – this time on my own schedule and this time with my wife. My journey to Nordhavn ownership started like so many others it seems and now four years after first setting foot on a N40 at the Southampton UK Boat Show in 2012. Now, I am the very proud third owner of N57 39 and I know I would not have succeeded without Jeff’s’ encouragement and unfailing commitment and patience. I found myself a year later with a day to spare in LA on my way home to Australia at the end of a family holiday while planning my itinerary. So, I emailed Nordhavn Dana Point and fortunately for me I picked Jeff’s contact to write too. Jeff agreed to pick us up in Santa Monica in six months’ time, drive my wife, Valerie, and I to Dana Point, show me over any brokerage boats for sale at the time, and then drive us back to LAX for our evening flight. True to his word, he did not forget and kept in touch as the time approached. Jeff asked two new owners if we could look over their 52 and a 60 that were being commissioned and then a couple of brokerage boats. Jeff took the time to listen to our position and was obviously proud and keen to share his experiences of the brand Nordhavn with us for the day, nothing was too much trouble it seemed. We returned home to Adelaide, Australia and Jeff and I started more than three years of email conversations as my plans progressed. He was instrumental in re-introducing me to the new Australian owners of the N60, Dianne and Rick MacClure, and I was very fortunate that Rick invited me to return to Dana Point two months later and assist on his first trip up the west coast to Seattle. I was hooked. Not long after this, Jeff advised me that he had decided to leave Nordhavn and start his own brokerage and I was very pleased to offer him my best wishes for his new venture. By then I thought I knew him well enough to sense he had too much energy and experience for the constraints of the Nordhavn sales office and would be far more successful on his own. Jeff’s passion for the trawler market and the lifestyle it can offer is infectious and unbounding and his genuine interest in his “clients” needs and aspirations I found helped me to keep going for several years as I sorted my business and personal life out to get to a position that I could be an owner. When the time arrived in August 2016, I had no hesitation in asking Jeff if he would help me to find the right used Nordhavn for us. I felt with Jeff’s experience, contacts and support we would find a better boat and get a better deal. With one month’s notice Jeff agreed to fly to Australia with his lovely wife Pam, and spend a week checking out a N57 that was for sale in Brisbane, for a very reasonable and fair financial arrangement. Jeff worked tirelessly for six days with me, going through every detail of the boat, checking, and at the same time “starting my training” in all the systems and what is involved in owning a Nordhavn. He worked all day and then answered questions and discussed the boat all evening. His support made all the difference in giving me the confidence to complete the purchase. I do not believe I would not have proceeded without his assurance that the boat was sound and an excellent example that would be perfect for us. The search and purchase process is a large undertaking that invariably takes years for a first-time owner particularly, Jeff has been there for me the whole way, never getting frustrated or impatient, and I know that this support will not end now that I have purchased. Jeff is not the type of “salesman” who you never hear from again once he’s got his commission. Thank you, Jeff, and Pam for all you have done to help me, I know I could not have done it without you. If any of your future clients would like to contact me, you are welcome to give them my details. Kind regards from a very happy new owner. Once we made the decision to sell our Pacific Seacraft sailboat and become more serious about looking at Nordhavns, it soon became obvious that we had a lot to learn. We did a lot of research online to find the right trawler and kept coming across Jeff’s name so we got in touch and asked him to become our broker. Jeff was incredibly patient as he answered endless questions and guided us through the boat selection and negotiation process. All of this occurred during the busy year-end holiday season. Prior to our trip north home to Washington, Jeff joined us aboard for a three-day weekend of training and orientation in April, providing hours of instruction and invaluable information. 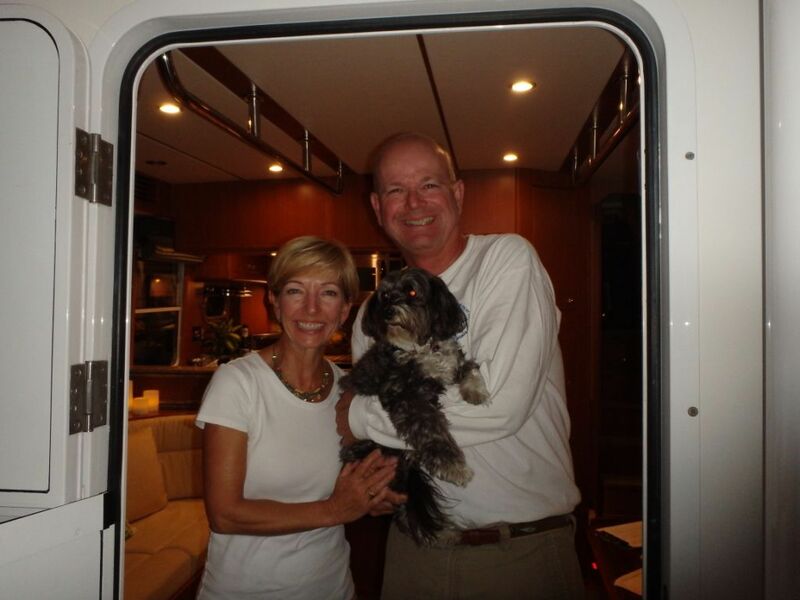 The level of service from Jeff before, during and after the purchase of our new vessel, was truly remarkable! An unanticipated benefit of working with Jeff is that it gave us the opportunity to also become friends with his incredible wife Pam! 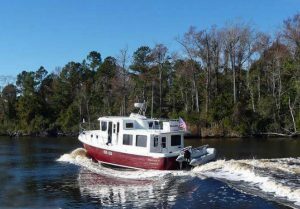 During Jeff’s first year as an independent yacht broker we asked Jeff if he would be interested in helping us find and purchase an American Tug 34. 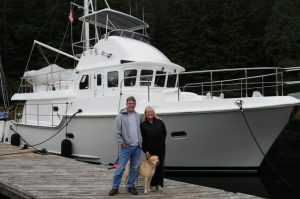 We knew this was on the small size of the trawler range where he usually deals, but it was no surprise that Jeff accepted—or that he offered terrific guidance and support right from the get-go. We first considered an AT34 in Michigan, but the seller decided to keep her and took her off the market before we could make an offer. We collaborated to work through a detailed analysis of several AT34’s on the east coast so we could compare our choices. 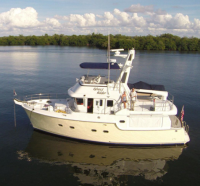 Our goal was to find a nice, clean boat that we could base at our home in Fort Lauderdale, a boat to be used mainly for cruising the Florida Keys. Jeff found a great candidate at the Baltimore Trawler Fest where he was giving some talks and meeting with clients. He toured the boat (red boat) extensively and then emailed us a couple hundred photos along with a thorough report summary of his impressions. Conveniently we were southbound from Maine on our way home to Florida and were able to swing by the TrawlerFest for a firsthand look. We liked what we saw—in fact we were really impressed with the red boat. But by them we’d made an offer, sight-unseen, on another AT34 in North Carolina (yellow boat). The yellow boat offer was accepted and Jeff flew out from CA for the survey, haul out and sea trial, but during the survey we learned some things that caused us to pause, and we withdrew the offer. Jeff flew back home and we continued the hunt. We considered another boat briefly (green boat), then decided to look more closely again at the Trawler Fest red boat. We joked that we were conducting “Operation Traffic Light” with the red, yellow and green boat mix. Our research included a lot of online study and speaking with American Tug owners and representatives from the factory. By then we were convinced that an AT34 was the right boat for us, we just needed to find the right AT34. After the haul out, survey and sea trial on the yellow boat, we felt better equipped to take a closer look at the red boat. 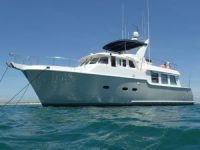 Jeff and the seller’s broker had several conversations and we learned the seller side was even more motivated since they did not sell her at the Trawler Fest. We had hundreds of photos to draw from and our own recollections from being on board. One of our concerns was that the red boat had been neglected and needed a thorough cleaning, especially the engine room. We wrote up an offer and requested that the dirty engine room be detailed–this was one of the things that had put us off originally. The idea was to get the boat in a more acceptable condition for review. Working with Jeff was like consulting with a trusted friend. We’d first met Jeff more than a decade ago during his Nordhavn days and enjoyed his company well before we started looking at American Tugs. We continue to touch base on a regular basis. There was never any pressure during Operation Traffic Light, and Jeff was 100% focused on helping us find the best total package, always putting our best interests first and foremost. When it comes to helping find you the right boat, then following through on every detail to get to closing, then supporting you waaaay beyond the closing of the sale, Jeff Merrill simply cannot be beat. If we hadn’t used Jeff as our buyer’s broker, we seriously believe the sale would never have closed. In our estimation he is the best of the best! And we were the true beneficiaries of his deep knowledge, his attention to detail, and his ability to negotiate a deal that’s fair to everyone. 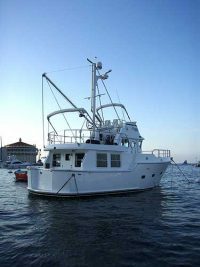 If you are looking for a trawler, any size or brand, we recommend contacting Jeff to see if he can help you as much as he helped us. About five years ago Christopher was in LA for business and arranged to meet Jeff in Dana Point where they toured some Nordhavns together. We have been talking and planning ever since about the day we purchased our own Nordhavn and decided to attend the Baltimore Trawler Fest. In Baltimore we sought out Jeff, got reacquainted, and after hearing what he had to say asked him if he could find the right Nordhavn 47 for us. We looked at a few boats and whenever something came on to the market, Jeff was able to provide hundreds of pictures of every inch of the boat. It seems like he has been on just about every Nordhavn build either when it was commissioned or displayed at a boat show. A few months later, after researching the available choices we made an offer on a Nordhavn 47 in Florida through Jeff and flew down to preview the boat before hiring the survey team. Unfortunately, when we arrived to take a look, the photos online did not live up to our expectations and we withdrew the offer. The Nordhavns we looked at were “fine”, but none of them was “the boat” for us. Jeff asked if we had considered the Kadey-Krogen brand. We had not seen their newer offerings, just some of the older models, so we were not even considering Krogen. Jeff encouraged us to have an open mind and gave us some great guidance; since there was a Krogen Open House in Stuart, Florida, why not make the trip down to see their line up in person? Worst case we could confirm Krogen was not for us, best case it would open us up to considering some an additional trawler option beyond Nordhavn. Good news, we loved the Krogens, especially their new line of AE (Advanced Ergodynamics) models, and one of the highlights of attending was we were invited to go for a ride and drive a new 52 to see how they travel through the water – we were impressed! A week after the Open House a one-year-old Kadey-Krogen 44AE named Sweet Ride came on the market with less than 100 hours. Jeff sent us a couple hundred photos that he had taken of Sweet Ride when she was brand new and on display at a Florida boat show and we were thrilled with the potential. With Jeff’s assistance we made an offer that was accepted. This is when all of the real work began and where Jeff really out shines the other brokers we have met. We booked travel to sea trial her, have her hauled and surveyed. Jeff had provided us with list of items to consider and logistics that needed to be resolved in order to buy Sweet Ride and get her from Florida to our home in New Hampshire. Once we got on Sweet Ride we were in love. This was the perfect boat for us! The sea trial was a breeze and we loved being at the helm. Work called and we could not stick around for the survey and haul out, but we felt very comfortable knowing Jeff would be there and would keep us informed of any issues. There were only a few minor issues (warrantee items) that needed to be addressed and Jeff provided us with photos from the haul out of the bottom, fins, rudder, prop etc. so that we could not see how she looked out of the water. The deal closed very quickly and it was time to make the boat ours. We are new to boats of this size and complexity so Jeff walked us through the myriad processes to register her, get new MMSI numbers, equip the boat with safety equipment and make arrangements to have her delivered by a skipper he recommended. Once Sweet Ride arrived home we puttered around on few short trips of less than 3 hours just to learn the systems and become familiar with her handling. A few weeks later, we wanted to move the boat down from New Hampshire to the Chesapeake Bay. Jeff and his wife Pam flew across country and met us at the Cape Cod Canal to begin the intensive training. Pam and Jeff are both world class sailors and yachtsmen. We could not have been in better hands. Jeff taught us engine room checks, built check lists for startup and shut down, labelled every component we should monitor and walked us through making a Red Binder with all the important info needed for the boat. He even included documents we would need if boarded by the US Coast Guard. We had so much fun with Jeff and Pam and their relaxed approach that we didn’t feel like we were being schooled all day. It felt like we were cruising with friends who are well seasoned. We learned so much on our trip from the Cape Cod Canal through Long Island Sound (including not to anchor at Plum Island). We learned how the importance of picking suitable anchorages, before we had just looked at the charts for proper depth and some shelter. As the sun set on day two we cruised through downtown Manhattan heading south for our first night run. After going through the final bridge in New York harbor and heading into the Atlantic we found ourselves in seas that were building and the wind was piping up. There is no way we would have felt safe without Jeff and Pam who were very calm and commented that it was “kind of lumpy”. Night running with a totally different beast that required us to rely on instruments so much more that visuals. Jeff helped us set up watches and tuned in our nav com and lighting for night running. A group of Kadey Krogens were about a half day ahead of us and they, like us, decided to pull in to safe harbor for a few days to wait for the seas to settle down. We ended up spending several days in Liberty Landing, NJ, with Jeff showing us more things about the boat and we even did some sightseeing in the city, all why staying at the dock waiting for a weather window. After several days of waiting, Jeff and Pam had to leave for another event and we were sorry to see them go, but much more confident that we could handle Sweet Ride ourselves. After Jeff and Pam left we felt much more comfortable with the boat and did a 55 hour run non-stop to the Chesapeake, all alone and had a blast! We were exhausted because we didn’t stick to the watch schedule, but we felt safe and very proud of our achievement. We continued our journey south making a few stops and eventually reached our final destination in Florida. We could not have done the trip done to Florida without Jeff’s guidance. Now we are headed back north after spending much of the winter in the Bahamas. Our plans are to cruise the Chesapeake until June then Maine for the summer. We have spoken to many cruisers over this past year and when we tell them about our experience with Jeff, we have learned that this is not the norm. Jeff provides so much more guidance and training than anyone we have heard of. 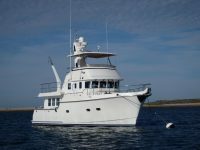 If you are in the market to buy a trawler or cruising sailboat, we recommend you work with JMYS. Before you find yourself committed, interview the broker you plan to work with. You may be surprised how few have real cruising experience and even fewer stay involved with their customers after the sale is complete. We consider Jeff to be a friend of the family and he treats us the same. We keep in regular contact and he is always available to answer a question or provide a solution. You will come to love Jeff and his Hawaiian shirts as much as we do if you select him to be your broker. We are looking forward to having Jeff and Pam back onboard Sweet Ride soon. I met Jeff Merrill a few years ago at one of the Trawler Fest and always enjoyed spending time with him. We’ve had many trawler related, casual conversations and I find Jeff very approachable and fun to talk with. 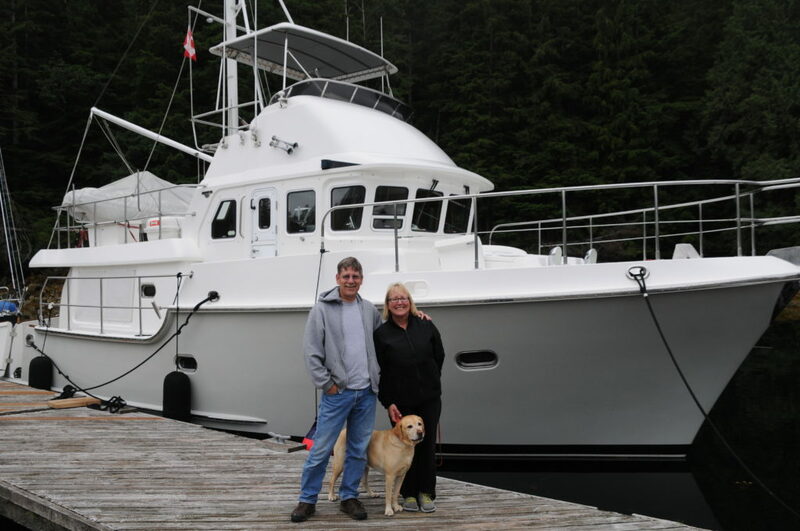 When I decided to sell my Beneteau Swift Trawler and look for a Krogen 44 I asked Jeff to represent me as a buyer’s broker. While on the hunt for the best Krogen, Jeff also gave me behind the scenes advice to help me sell my Beneteau, an experienced broker to bounce ideas off of while I was working through the sale. Once my Beneteau Swift Trawler closed we worked together in earnest to find a Krogen 44. Jeff has a great relationship with Steve D’Antonio and I knew that having them both on my side would give me a one-two punch with both a knowledgeable broker who would look after my best interests and the world’s best inspector to check out every detail of the boat I wanted to purchase. Jeff and I found a Krogen 44 in Florida and Jeff negotiated a deal that led to an accepted offer. During the survey dates (sea trial and haul out) Jeff educated me on various systems and explained how things work. He also kept his eye on the market and found out about another Krogen 44 that had just become available. This created a dilemma because I was very far along with the original purchase, but we put things on hold and went to look at the sister ship KK44. I don’t know any other brokers who would change tacks at the stage we were in, it would have been a no-brainer for Jeff to just let things be…but Jeff told me he was approaching this as if it was his money being spent and we both agreed that the second boat was a better value. So, we canceled the first offer and switched to boat number two, for this I will always be indebted to Jeff. Steve had already done his inspection on the first 44, so the same survey team along with Steve was re-assembled to evaluate the second Krogen 44, called Next Dance. The sellers had really made some great improvements and loved their Krogen, but, like a lot of boat owners, wanted to order a larger Kadey Krogen, a 48AE. As a bonus, they were on board and completely available to tell me about their 44. We all clicked and I found the sellers to be wonderful people who were very giving in their time and made me feel me proud to take the helm from them. Next Dance was in better condition and had better equipment than boat number one. As I look back I see how easy it would have been to stick with the original plan and not make the change, but how much happier I am that we did. We did the trial run, survey and haul out with no issues and closed the deal. Once I owned the 44, renamed The Promises, the relationship with Jeff continued. We talk and email regularly and he is genuinely concerned with my satisfaction and enjoyment. Jeff prepared a binder filled with training documents and check lists to accelerate my learning curve. I am amazed that Jeff, who has his HQ in California, travels to the east coast and especially Florida so often, but he told me he is a licensed yacht broker in CA and FL and spends a lot of time away from his desk to make things happen. His network of contacts, along with Steve’s resources really made them an incredible team to work with. Communication was fantastic throughout and it was fun to be learning all about the boat before I actually owned her, a great boost to my comfort level. There are a lot of details in the process of buying a boat (especially when you go through the process twice during the same run) and Jeff kept me on track and focused. 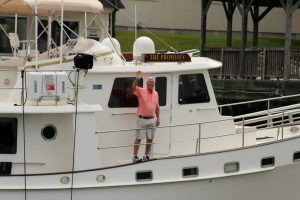 Jeff has decades of cruising experience and his product knowledge of trawlers is second to none. For anyone in the market to purchase a trawler I highly recommend Jeff Merrill for his professionalism, enthusiasm and organizational skills. Jeff is more than a broker to me, he is now a good friend! 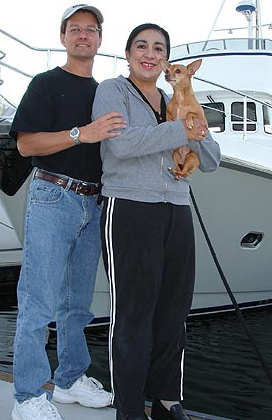 We met Jeff a few years ago at the Lake Union boat show in Seattle which is near our home. Jeff showed us around a Nordhavn 55 that was on display and we quickly made a connection that he was a good fit for us and really knew the product. Throughout the entire daunting purchasing process ie: survey, negotiations, closing, finding insurance, financing, moorage etc. Jeff was with us the entire way providing much information and keen insight. We had no idea how much service he provides – not only educating us about our choices and helping with negotiations, but the training after the sale (Jeff you need to let people know what an amazing job you do)! On our Grand Banks 42 we have gone from Alaska to Mexico, but it was an adventure and intimidating at times to buy a much larger boat in Florida and use her in unfamiliar waters. 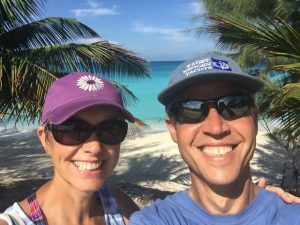 We took the opportunity to learn the boat by making two trips over to the Bahamas before Jeff could join us for five days in February for some intensive training. This worked out well because we had time to figure out a lot of things during our first couple of months, we also prepared a long list of items that we needed his help with, including figuring out how the backup nav/com computer worked and teaching us some of the tricks to docking a tall single engine boat. Jeff’s calm and supportive approach to orientation was perfect. He showed us all about the electrical panel, bilge pumps, windlass, fuel system, etc. We also got a lot of practice in close quarter maneuvering in tight marina spaces. He also prepared a comprehensive training manual with dozens of helpful documents and check lists. It is incredible how much he shared and how much we learned in just a few short days. We will be forever grateful for his support and know he will be there for us in the future. We have talked to a lot of brokers over the years, but never one as thorough, knowledgeable and supportive as Jeff. 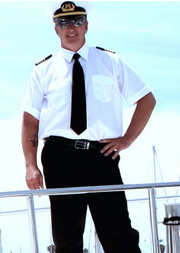 He has a lot of interesting observations, a fun sense of humor, and we truly enjoyed his company on board. Looking back, we now realize how important it is to find the right yacht broker. Jeff made it much easier to find the right boat and most important, how to enjoy it. 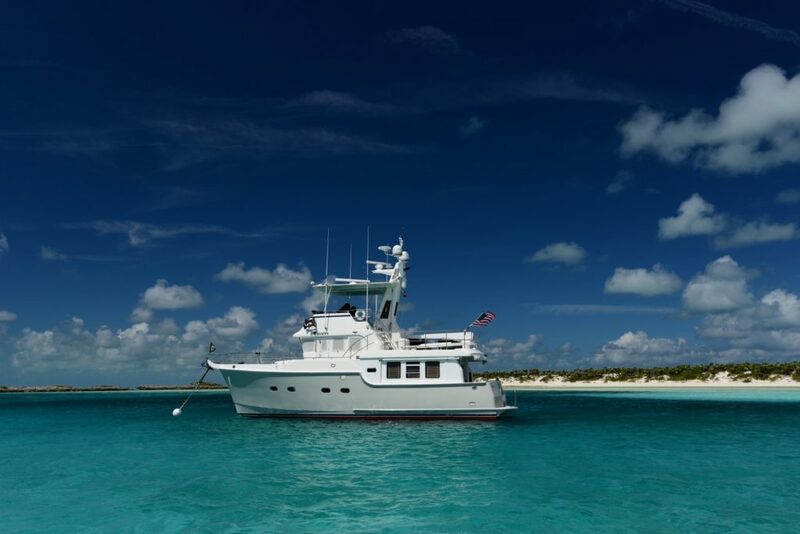 For anyone looking to purchase a trawler we strongly recommend and enthusiastically endorse Jeff Merrill Yacht Sales. Jeff gave us inspiration, knowledge, and preparation that ultimately helped us complete our circumnavigation from 2007 to 2009. We visited 34 countries and had the most amazing time of our lives. 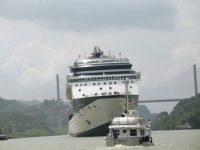 Our boat took us around the world in comfort and safety, with minimal hassles. That was no accident! Prior to leaving, we talked to Jeff almost every week — for over two years! We discussed preparation, options, equipment, and planning. We could not have done our big plan without him. We whole heartily endorse Jeff, and can think of no one better represent someone in a boat purchase. Our advice is share your plans, thoughts, and concerns with Jeff. He will become your greatest advocate and help your dreams come true. Jeff has a relentless attention to detail, consistent follow-up, and unwavering professionalism. Jeff made us feel like we were his singular focus, yet we knew he had many other clients. We have chatted with many of Jeff’s other clients, and we all seem to unanimously agree that Jeff is the crème de la crème of the industry. We first met Jeff In January of 2015 at the TrawlerFest in Riviera Beach. 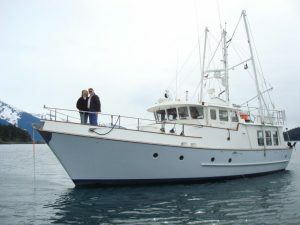 Michelle and I had been researching our next boat-buy for about 2 years, and at that point we had narrowed it down to Kadey-Krogen and Nordhavn, roughly in the 47-to-55 foot range. That TrawlerFest was our opportunity to once again get onboard and hands-on with both brands, but also to attend several targeted seminars aimed at educating wannabe wanderers such as us. And that was our first encounter with Jeff. His “Pride of Ownership” seminar was, of course, quite illuminating and helpful. But he was also in the process of selling a brokerage Nordhavn 55 at the Fest, so we also ended up spending quite a bit of time with him aboard that (very nice) boat. Eventually we got into the discussion of which boat was best for us. I was impressed not only with his knowledge of the boats, but also his objectivity – and what appeared to be a genuine interest in what was best for us, not just what he happened to be selling at the time. We also met his long time friend and JMYS associated Florida broker, Ray Danet. 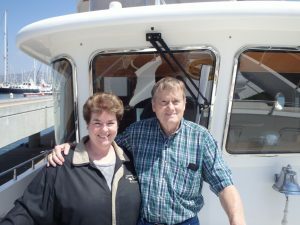 We spent a lot of time talking with the two of them and learned a lot of insights into many aspects of trawler ownership during these casual conversations. Fast forward a couple of months…we’d focused in on the Nordhavn 47 as the best fit for us, but we wanted some confirmation – and we’d become convinced that we really wanted (and perhaps needed) a broker to champion our buy-side interests. Jeff had kept in touch with us, he has great follow up, but we hadn’t yet formalized a committed relationship so I pinged Jeff to see if he was interested in being our representative and fortunately he was. Then the real education began. The amount of information and knowledge Jeff brings to the table is astounding, but even more impressive is his willingness and ability to share it….with considerable enthusiasm. We probably learned more about trawlers and the Nordhavn 47 in a month via emails and phone conversations than we’d managed to in the previous 2 years. The manner in which he led us through objective and comparative analysis on each potential vessel was extraordinary. And his constant reminder that “you don’t need a boat” helped keep us centered. 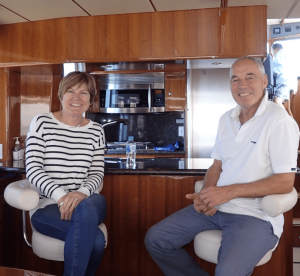 He also put us in touch with several Nordhavn 47 owners (most of whom are clients of Jeff and his far reaching network) exposing us to valuable first-hand, real-world feedback. Once we got to the offer / survey / sea trial phases (over the course of several months) Jeff continued to facilitate the process with objectivity and with hugely helpful pointers and suggestions. (We wondered: is there anyone in the industry Jeff doesn’t know?) But he never pushed us. Once we committed to the purchase, Jeff was also instrumental in shepherding all the moving parts and pieces into a coherent and stress-free closing process. Jeff has developed a proprietary time line document that had dates, deadlines, and all of the relevant details outlined and organized. That he was able to do all this even though he was based on the west coast of the U.S., and we were doing all of this in Florida, was equally amazing. Finally, when the evaluation and purchasing process was over, and the actual ownership experience began, Jeff was right there on board with us. It’s hard to describe the immense body of knowledge and practical experience that he brings with him and manages to impart, but let’s just say he drastically accelerated our learning process – and with an easy style that made it great fun as well as educational. Jeff flew over to Florida and we had several fun days aboard cruising, labeling, working on spread sheets and reviewing many of the critical aspects of owning a trawler all of which made us intimately more comfortable and built up our confidence. Lastly, and very importantly, we made a good friend, and in the process gained a mentor for the long haul to whom we can reach out at any time. Can’t even begin to put a value on that. 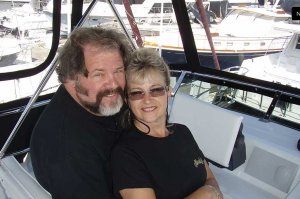 My wife and I had been preparing for the boating life after retirement when we first met Jeff. He was teaching a class on “How to Purchase a Trawler” at the Trawler Fest and we found his information very useful and appreciated his relationship approach to matching the right boat with the right owners. 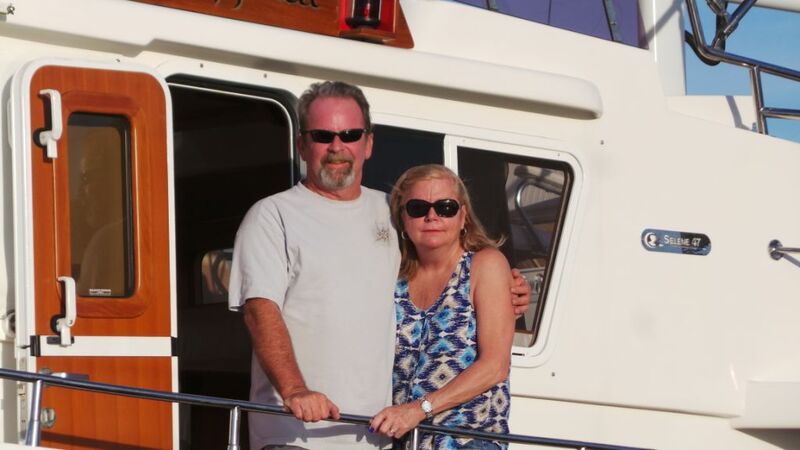 We contacted Jeff when it was time to search for our “right” boat and began a very stress-free process. He patiently listened to our needs and concerns and was a great resource for us without ever adding pressure. We worked together to consider several options and he set up many appointments for us to view several brands and sizes which was incredibly important to help us evaluate and understand what would work best for us. Through Jeff’s many contacts, we did find the “right” trawler and along with his team of specialists, purchased our retirement dream boat. Jeff helped with the arrangements for the survey and trial run and had a very organized approach to the whole process, it was very clear he was committed to making this enjoyable. We had a short window to get everything done and Jeff’s organizational skills showed a lot of experience working with couples like us who really like working with a professional. Jeff’s expertise extended beyond the sale, as he assisted us with the delivery of our boat to our home port, as well as providing boating advice and direction as needed. He gave us a binder full of check lists and really helped us become familiar with both our new boat and the trawler lifestyle. His availability to answer questions and provide resources continues today and we appreciate an ongoing friendship with him. 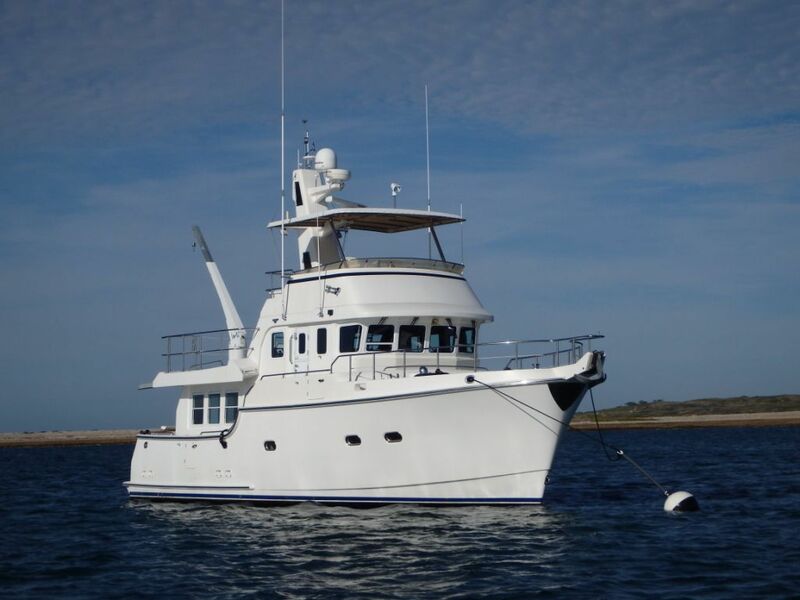 We are very happy to recommend Jeff to anyone considering buying a trawler. Thanks Jeff! 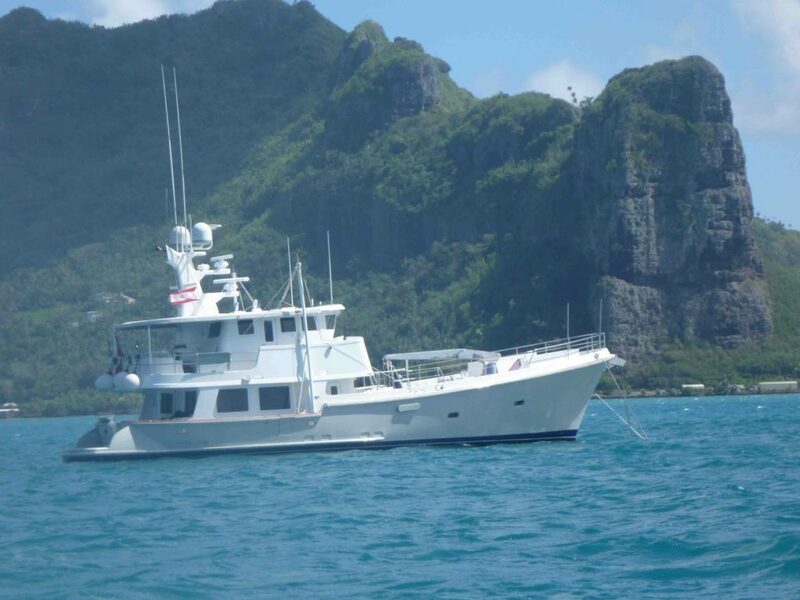 Jeff represented us for the purchase of our Nordhavn 47 in 2012. He is very knowledgeable and has a wealth of information that he shares with his clients. His attention to detail is excellent, both in regard to the vessel being purchased and the transaction documents. While he is based on the west coast, we have frequently seen him working on the east coast, and that is where our transaction took place. In the over-crowded field of boat brokers, Jeff stands out as a true professional, and someone you will call a friend after the deal is done. I don’t know of another yacht sales person that would do the same, but Jeff met the buyer and me in Singapore, just as the survey was finished. The transaction was completed without a hitch and we enjoyed a brief tour of Singapore together before flying home. Needless to say, a few months later, when it came time to buy a boat to fit our Pacific NW cruising plans, Jeff was the first and only person I called. 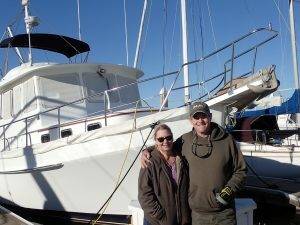 Jeff flew up to Alameda to meet me and we surveyed the boat, a Nordhavn 47, and completed the sale. 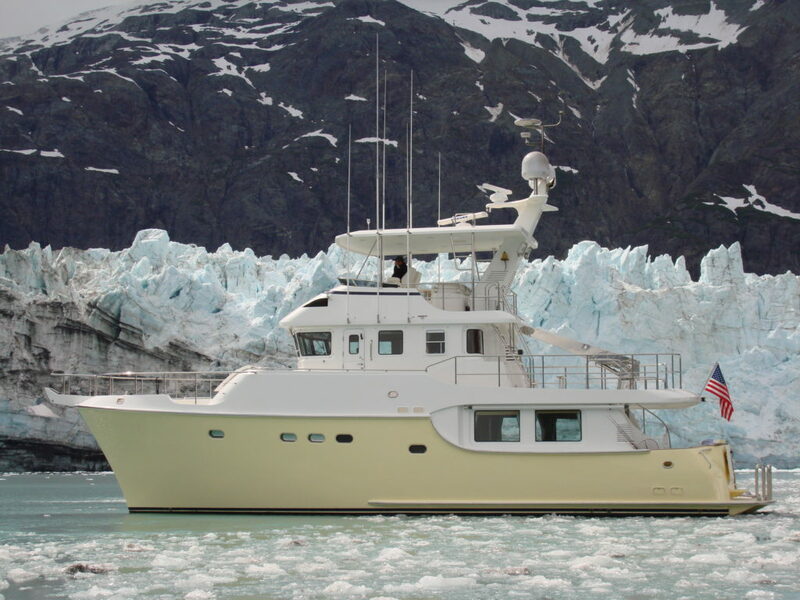 Arcadia II has been the perfect second Nordhavn for my wife Phyllis and I as we have enjoyed several seasons cruising Alaska. During all of this time Jeff has stayed in regular contact and remains a good friend. We just wanted to write to you and let you know what a great experience we had buying our second Nordhavn. Our first Nordhavn was 57-39 which we had built and called “Senjero”. We sold her in 2010 and now we love our Nordhavn 55, (55-05) which we have named, “Insignia”. We stopped in the Nordhavn offices for a few days after completing a 1200 mile non-stop delivery from Seattle to Dana Point. The boat is now in Ensenada so we can participate in our third FUBAR. The reason for this email is to let you know how professional and helpful everyone at Nordhavn has been from the receptionist to the rest of the staff when we visited the Nordhavn offices in both Dana Point and Seattle. We really appreciated it! And, most importantly, we wanted to let you know what a great job Jeff Merrill did in representing us. As background, when we listed our 57 Senjero for sale through Nordhavn, we had a great experience working with Jeff, as we sold the boat quickly at very near our asking price. Jeff did a great job in all our negotiations. We always knew there’d be at least one more Nordhavn in our future and we kept in regular contact with Jeff who we felt was not just our sales rep but a friend. Jeff arranged for us to see our current boat in Seattle with Don Kohlmann since Jeff was on vacation. We loved the boat and asked Jeff to help us prepare an offer. Jeff was very clear that he had a dual obligation in representing us and the sellers. We worked out an offer and after a little negotiation, it was accepted. Buyer, seller and broker all came together to make the sale happen. We then flew up with Jeff to Seattle for 3 days for the sea trial/survey on short notice. Jeff’s product knowledge and salesmanship helped seal the deal and he was so thorough and organized keeping everyone involved via email and phone calls, to-do lists, reference numbers, as to all the steps needed to complete the sale. We were all under an incredible time crunch, and if it wasn’t for Jeff’s thoroughness, things may not have been completed in a timely manner. 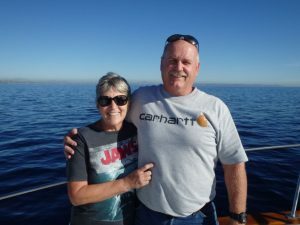 But the most important part for us was that Jeff said he would help us take the boat from Seattle to Dana Point to help us learn the systems of the boat while underway. This was an incredible offer since this boat was new to us and we needed to get it to Mexico so we could prepare it for the FUBAR. Jeff helped us with learning all the boat’s systems and engine room checks. And even though we had experience with Nordhavn’s in the past, the training and insights from Jeff gave us confidence to operate our 55. We are very appreciative of Jeff and we will highly recommend him to our friends and anyone looking at Nordhavns. We are happy to be Nordhavn owners again! We met Jeff Merrill over five years ago at the Lido Boat Show (Newport Beach, CA). John was hooked on the Nordhavn at the time and had heard that Jeff was the guy to work with. Jeff took us under his wing, educated us on all the variety of boats available in the trawler market and was happy to work with us over the long haul helping us make our plans – never pushing, always helping. John got busy doing his homework. Jeff communicated with us regularly and supplied us will all sorts of informative materials. Through this long time working together we became fast friends. It’s amazing now that we own the boat to look back having enjoyed a five year relationship with Jeff – JMYS.com – he is our broker and go-to guy! Couldn’t have done it without you, Jeff… Thank You ! ! ! We have both been boat owners our entire life, most of which was restricted to lakes and rivers. Along the way Jeff got us thinking about our individual marine resumes to help with insurance rates. We started working on that when John’s business had a serious buyer. 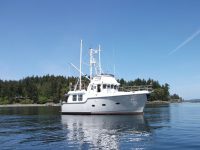 We spent December 2014 seriously looking at trawlers for sale in the Pacific Northwest in preparation for making a buying decision in the spring. 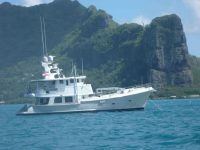 Jeff supplied all of the info and connections for us to look over ten Selene’s and one Seahorse over the holidays. We created boat reports with pictures at the end of each day. We narrowed 11 boats down to 4, a very complicated task and would not have been able to do it without him. Jeff’s knowledge, experience and dedication insured our wise decisions. Upon returning to work in January, we learned there was a serious offer to purchase John’s business. Retirement was looming on the horizon! Time to make a decision…which 1 of 4? With plans in place to attend TrawlerFest, Anacortes in May, it seemed logical to make an offer on “the boat” while in PNW. Our decision was made. It was the 2004 Selene 47 hull 14, in Portland. That Selene Yacht choice gave our budget some “wiggle room” to set her up as our own. 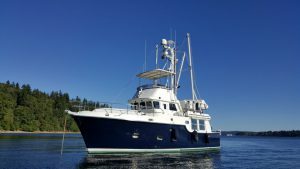 Our offer was accepted and the survey, haul out and sea trial was scheduled prior to attending TrawlerFest Anacortes to make the most of our time in the PNW. We arrived in Portland early to learn our way around and glance at the boat again. We could not board her until the seller’s broker was present. 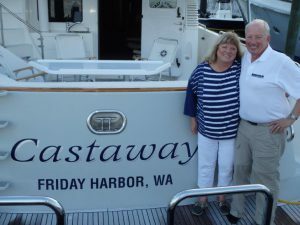 Jeff and his wife Pam arrived, we had a great dinner on the river and got to meet the ship that evening prior to the sea trial and survey to check out the systems and lights. She was more majestic than we had remembered! The owner had moved out and this whole thing felt very real! Jeff and his wife Pam spent that entire next day with us going over every system while the surveys were underway. As part of our preparation, Jeff made sure we had all of the numerous USCG regulations, forms, links, lists, advice, etc. While the survey and sea trial were underway, Jeff gave me a list of mandatory things to find, a scavenger hunt for safety gear, GFI’s, HIN# locations, etc. We had to leave late afternoon to begin our drive to Anacortes for TrawlerFest classes. Before we left, Jeff handed us a flash drive with almost 500 pictures and he stayed over that night to make sure the surveys were complete. It was very remarkable how well the timing worked! Everything was falling into place so perfectly. John was retired and the boat would be ours before the end of May. We had a great time making the most of the event. We stayed busy with 5 days of classes including Jeff’s, “Don’t be Afraid of the Dark” and “Pride of Ownership”. With a successful survey report it was time to get our documents in a row, lots of documents to get through the closing! Jeff gave us lists of records to duplicate and maintain on the boat…little stuff like checklists, waste plan and the bill of sale, etc. Today we are the proud owners of MV Paradice, 4714. She is on the Columbia River at Salpare Bay Marina. We continue to go back and forth between Las Vegas and Portland making Paradice our own and outfitting her for blue water! Jeff is still by our side making blue water cruising a reality. JMYS is the BEST! 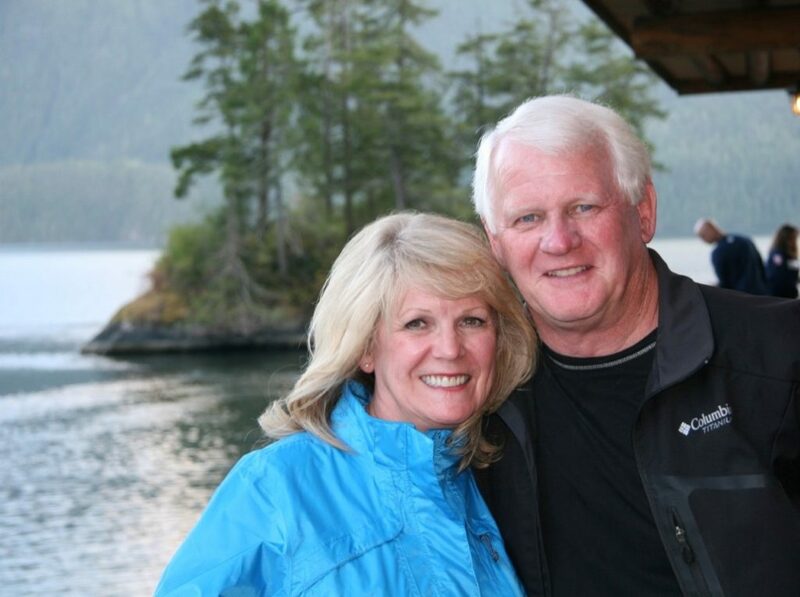 We will always cherish our relationship with Jeff and Pam…Thank You both! Buying a power boat after being a life-long sailor required not only a lot of soul searching, but also a huge dose of learning. Just wading through the myriad of power boat choices took months of study. My wife and I read about trawlers and felt this type of boat seemed a good fit for us. We planned to live aboard full time so the creature comforts a trawler afforded were attractive. 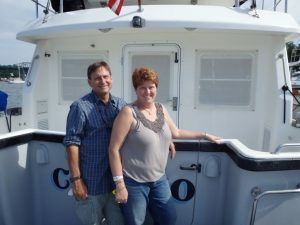 For our first boat show we attended the Baltimore Trawler Fest. We signed up for as many classes as possible to learn more about the boating lifestyle, and we toured dozens of boats from various builders and of varying length. We were peripherally aware of many of the brands, but had not seen or boarded any trawler before the show. There were three Nordhavns on display – a 40, a 43 and a 47. Jeff Merrill was aboard the Nordhavn 47. We had met Jeff after one of the classes that he gave and knew already that he was a wealth of information. We plied him with more questions specifically related to the Nordhavn 47, and he spent almost 2 hours going through the details of the boat. We left Baltimore with the thought that a Nordhavn 47 might just be the boat for us. After the TrawlerFest Jeff sent us some details and followed up with some phone conversations to gauge our interest and help us continue this process. As we went into detail on the Nordhavn 47 Jeff provided a list of the model history that showed us when certain changes were made (like going from 12V to 24V) and other details so that we could evaluate the market of previously owned Nordhavn 47’s with some good background information. This was very helpful in allowing Susan and me to determine what features were on our ‘must have’ list versus our ‘nice to have’ list. 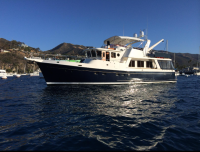 One boat for sale in California seemed to fit the bill – it had all of the ‘must haves’ and many of the ‘nice to have’ features. We scheduled a trip and spent a day on the boat with Jeff, asking many questions and learning more not only about that particular boat, but also about N47s in general. Unfortunately, by the time we were prepared to make an offer, another buyer put the boat under contract. Back to the drawing board! It was getting near the end of year and the number of N47s on the market was dwindling. Susan I and once again perused the list of boats for sale and honed in on one, “Winkin”, that appeared to meet most of our requirements. This boat was much farther afield (Rhode Island! ), but even with the holidays rapidly approaching we were able to schedule a due diligence visit with Jeff after putting the boat under contract. We spent three days on the boat with Jeff and the surveyors. Throughout the evaluation Jeff took notes, snapped hundreds of photos and provided very helpful Nordhavn specific training, making the due diligence trip educational as well as enlightening. After we closed the deal, Jeff reiterated his commitment to continue his training by spending time aboard with us, after we had time to acquaint ourselves with the boat. We splashed the boat in April and in early June he flew out to Boston for four days of indoctrination on the newly christened “Dragonfly”. We talked about systems, maintenance, tools and spares, boat handling and many not-so-critical but helpful topics. We also cast off the dock lines in Portsmouth, RI and spent two days at Cuttyhunk Island. This enabled us to get real time training while underway, as well as to set the flopper stopper, work with the hydraulic davit, change the oil, and learn to manage power while away from the dock. Now it is September and since then we’ve put 300 miles on the engine, going to Maine and back and heading towards Florida. Jeff has stayed in regular contact and we’ve shared ideas and solutions along the way. It’s great to know we have a friend and an expert in the trawler world. 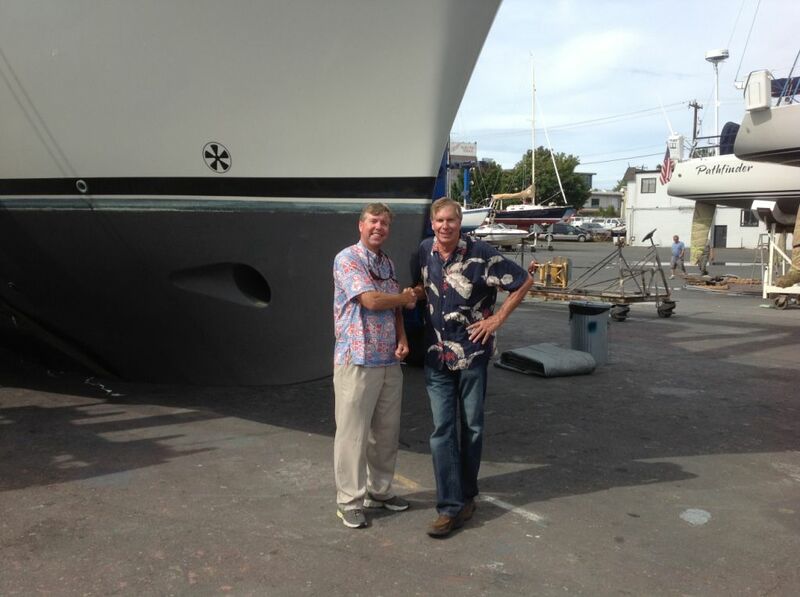 For anyone in the trawler market, I strongly recommend Jeff Merrill as an expert, thorough and friendly yacht broker. He will help simplify the boat buying process and will provide continued support and training even after you’ve closed the deal. This was very important for us and something that most boat brokers don’t offer. Please feel free to contact me if you’d like to discuss our experience in person. 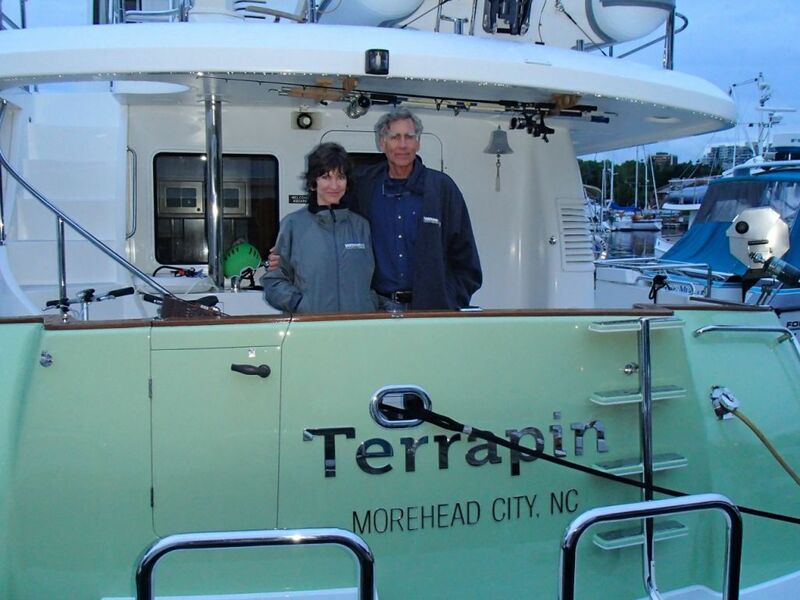 It’s been going on two years now since you helped us find and purchase what has become our beloved Nordhavn 55 “Terrapin”. I’ve not stopped to really say thank you for taking such good care of us on our boat buying journey. You did such a nice job of understanding what we wanted and being sure we both got the boat that was right for us. Not only did you find us just the boat we were looking for, but you made sure we knew how to operate it. Your knowledge of Trawlers in general and the Nordhavn line in particular was invaluable for us. Anytime I’m talking with a friend who’s thinking about a boat purchase I recount our experience in our first phone call with you. I’m sure you recall. It was an introductory call that ended up being a 3 hour in depth discussion of our ideal boat. Toward the end of the conversation you very gently said you weren’t trying to push us but there was a boat that met all of our criteria sitting in Seattle looking for a new owner. We agreed that night to start the buying process. We had given ourselves two years for the boat buying, or building, process which thanks to you ended up taking not much more than 2 months! We’ve now put 5,000 miles under the keel, been places we’d never planned on and enjoyed every minute of it. Thank you for being the consummate professional and our good friend on the water. I hope your new venture as an independent broker is everything you wanted it to be. I’ve no doubt it will be successful. When Jeff first told me of his decision to leave PAE and start his own business my first thought was “you can’t leave, you are PAE”. After 15 years, three Nordhavn’s and more phone calls than any sales representative should ever have to deal with Jeff has become family and hearing of his departure just didn’t feel right. After the initial shock we quickly realized that our Nordhavn days didn’t need to end since our next boat would likely be a used boat and possibly another make and who best to assist us in these unchartered waters than Jeff? We first met Jeff in 2001 at the Long Beach, CA Trawler Fest and have driven him crazy ever since. His patience and no pressure approach resulted in us building our first boat (Nordhavn 40 hull #50) on a tight budget in 2005. Jeff was instrumental in helping us make the proper equipment selection while staying within budget. 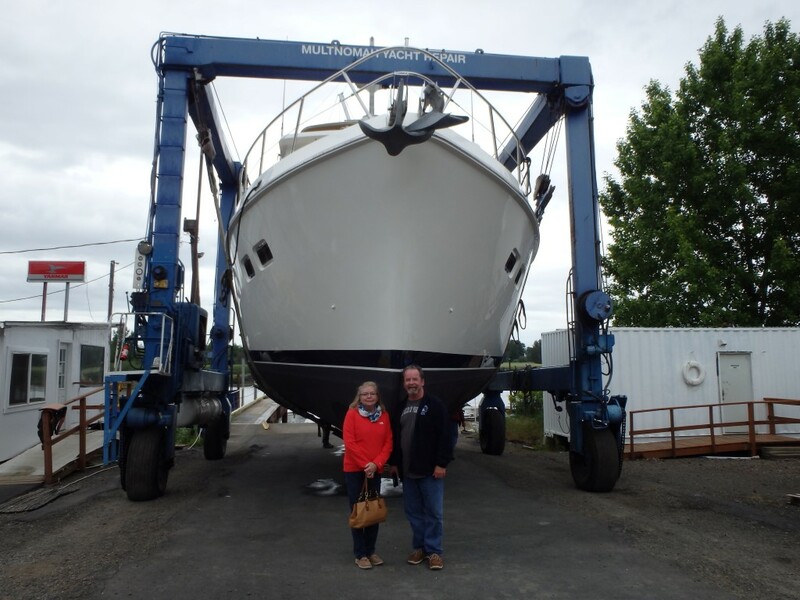 When we decided it was time to sell the boat Jeff guided us through the process and found us a buyer within a few weeks of listing her (proof that his equipment selection recommendations not only provided us the right boat, but also a boat that was appealing to others). It didn’t take long for us to realize we made a mistake selling N4050 so we called Jeff and told him it was time to start the process over. Once again Jeff helped us build a boat configured for us (Nordhavn 40 hull #61) and we couldn’t have been happier. Just when we were starting to enjoy the boat one of life’s unexpected events hit us and we needed to sell her. Unfortunately timing was not on our side as the economic recession had set in and boat buying wasn’t at the top of everyone’s agenda. Jeff remained positive as he worked his magic and found us a buyer who we became friends with and allowed us access to the boat for another year. After a few years away from boating we decided it was time to get back on the water. 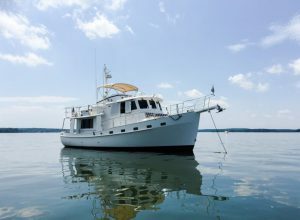 We asked Jeff if he could find us a clean, late model Nordhavn 35 for us to test the waters. Jeff, working with the sales team at PAE, went the extra mile (again) by reaching out to N35 owners he knew and just asked the question “Any chance you might be ready to sell your N35?” As if faith was listening, Jeff found a very clean boat in southern California and we closed a private sale deal in 30 days. 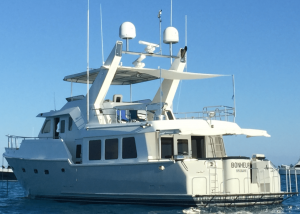 It’s likely no surprise by now that when we were ready to sell the N35 (last year) we enlisted the support of Jeff to help us with list and market our boat – one of the first deals closed for his new brokerage. The past 15 years have gone by quickly and as we look back at all the great times we have enjoyed living aboard and cruising along the coast we owe it all to Jeff. He is trustworthy, reliable, knowledgeable and most of all a good friend. Now that we are settled in our new beach house it is time to start looking for our next boat to stay on the water until retirement and possibly another trawler. Regardless of the boat, Jeff will be part of the process and helping us stay clear of rough waters. We wanted to write a short letter of thanks for your guidance and support in helping us find our mistress! Hopefully you can share this letter with other clients and potential buyers to show how you helped us through this process. We are still very much in love, and poorer…but happy!! The experience we had with you from first email contact at midnight, followed by many long phone conversations helping us work out what we really wanted vs. what we needed, to looking at boats in Maryland and finding our boat in Rhode Island, to the cigar after purchase phase, to training, to cheerleading support, to kicking us out of the nest to embark on our 700+ mile delivery adventure, to finally a vast friendship, Jeff you wore every hat with distinction! Great communications (phone, email and text) throughout and you really know trawlers. We picked the right broker and we have no regrets or complaints! Amazing how it all worked with you based in California and us living in Florida. We are blessed with great new habits in our 30+ point engine room check list you created, educational handouts from your articles and talks, and extensive product knowledge from a professional. It was about 10 years ago I began my search for a reliable, seaworthy offshore passage maker. I spoke with several Canadian builders and even had a preliminary design done for a custom build. But the further I got into the project, it seemed to slide farther beyond my reach. 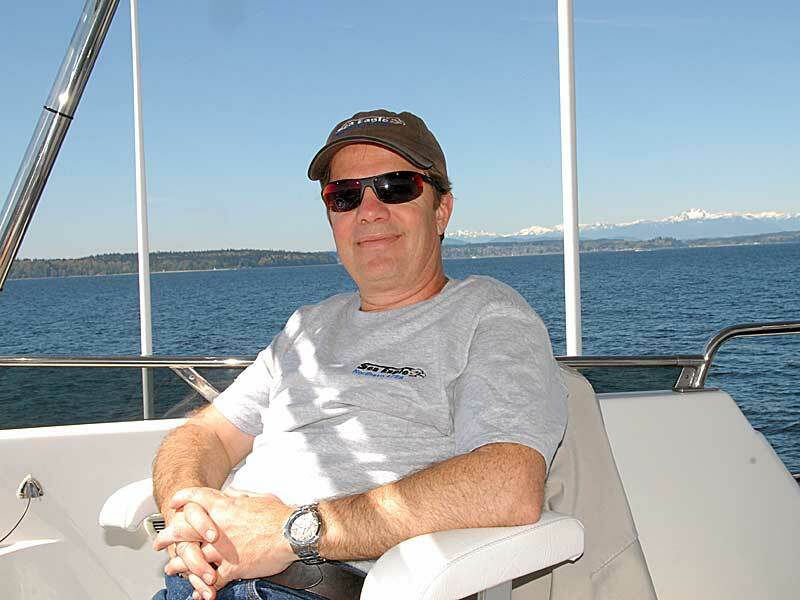 At the Seattle Boats Afloat Show, I ran into Jeff Merrill who at the time was working for Nordhavn. After Jeff listened patiently to me for awhile, he opened a set of drawings of their latest creation, the Nordhavn 55. It had everything I was looking for in a comfortable, reliable, and well engineered “Ocean Crosser”. 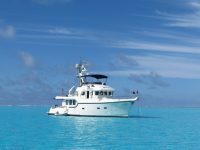 It’s been said that when you’re buying your dream boat, you’re buying the company who builds it, because the company’s reputation is inextricably connected to your boat as long as you own it. But I found the salesman who sells it to you is of equal importance. There are countless details and decisions that are made, and I found Jeff Merrill is a master at cutting the meal up into bite sized pieces. He carefully fed them to me making useful recommendations along the way and keeping me informed with thoughtful emails and photos. Looking back, it seemed Jeff played the part of Owners Representative, that he was looking out for my interests first. This was really was the foundation of a long and close relationship with Jeff. My new Nordhavn 55 was one of the first commissioned in Seattle, Jeff made several trips to Seattle to check on progress and to train me on systems and boat handling. In the years that followed, Jeff continued checking in with me, he asked about the boat and the places we’ve travelled to. We caught several of his classes taught at the Trawler Fest where he continues to be a leading proponent of Do-it-Yourself ocean crossing. Jeff has been involved with boats his entire life. He has been nearly everywhere in about every kind of boat imaginable. He enjoys meeting people and he’s a very good listener. When it’s time to look for my next boat, I’ll start with Jeff Merrill, a good friend with a proven track record. I’d like to take a moment and chronicle my experience with Jeff Merrill over the last 15 years. 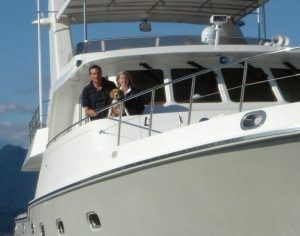 I’ve been a boater much of my life, making the transition to diesel trawlers with the purchase of a 31’ Camano in 2003. After establishing a love for the cruising lifestyle my wife and I made the decision to purchase a Nordhavn. We contacted the company and were assigned a sales person. After an initial assessment the sales person had us sign a purchase and sale agreement with no price, no delivery schedule and no commitment of any kind. After 3 months of continued confusion about exactly what I was getting I decided to disengage from the purchase process. A year later I got a call from Jeff Merrill. Jeff had been handed my folder and told I was a difficult customer, that maybe he could work better with me. As I came to meet and know Jeff I become convinced he was the person I wanted to assist me in purchasing our Nordhavn. Within 3 months we found and purchased our boat, a 40’ slightly used Nordhavn moored in Dana Point at the corporate docks. You should have seen the look on the other salesman’s face when he saw me arrive to complete the purchase, he would have bet $1,000 I would never come through with a purchase. I tell this story because it so perfectly captures Jeff’s value proposition as a salesman. Jeff doesn’t “push” you into buying any boat, rather he leads you through the path of becoming educated enough to make the decision that is right for you. Jeff never failed to answer a phone call or email and never failed to provide factual, accurate and complete information. 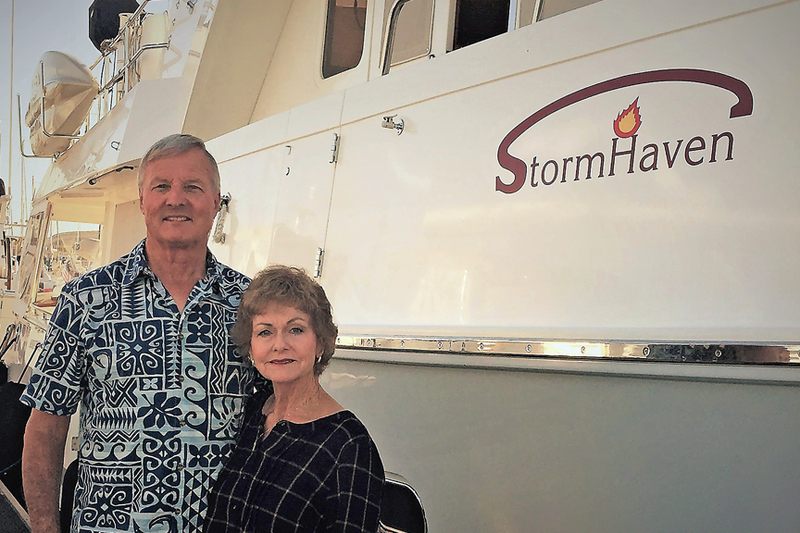 Jeff even introduced us to the couple selling the boat before the transaction was complete, because he wanted the boat owners to know the boat was going to a couple that would appreciate the heart and soul they had poured into her. Jeff’s support didn’t end with the completion of a sale. Jeff was a constant companion in answering questions and providing additional support for years. As my wife and I departed for a trans Panama Canal journey to the East Coast he arranged a parts pickup in Dana Point, including wheeling a 100 lb. box of zincs to the boat on a hand truck. What you get by doing business with Jeff is a complete feeling of confidence and trust. Jeff is the kind of person you cherish meeting in life. He is the kind of person you want as your wing man or co-captain. It would be almost impossible to overstate how competent and capable he is, but mostly, he has integrity. In the world of boat buying, he is indeed a rare find. In summary, I have complete confidence providing a total and complete recommendation for Jeff, with no reservations or caveats. If/when I go to buy another Trawler; there is simply no one else I would consider having on my side of the transaction. Paradise Found, you can too! 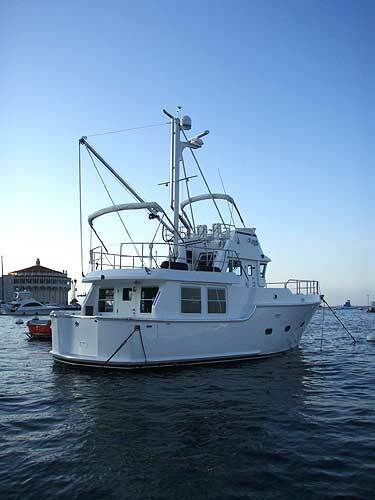 If you are in the market for a trawler, I whole-heartedly recommend that you speak to Jeff Merrill. Jeff is extremely knowledgeable about trawlers and was a pleasure to work with through the process of purchasing our Nordhavn. We asked Jeff to find us a particular Nordhavn model, age, equipment, etc. He found exactly what we were looking for and we cannot be more delighted with our Nordhavn 60. Jeff was beyond diligent through the entire process providing us with more information than we could possibly digest. 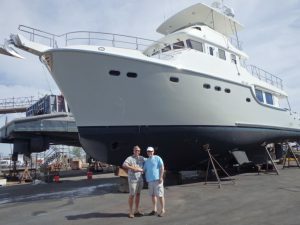 After finding a boat he had built originally and arranging the potential for a private sale, Jeff traveled with us to view the boat in Mexico and pointed out all the great features, but was also honest and pointed out a few minor flaws. 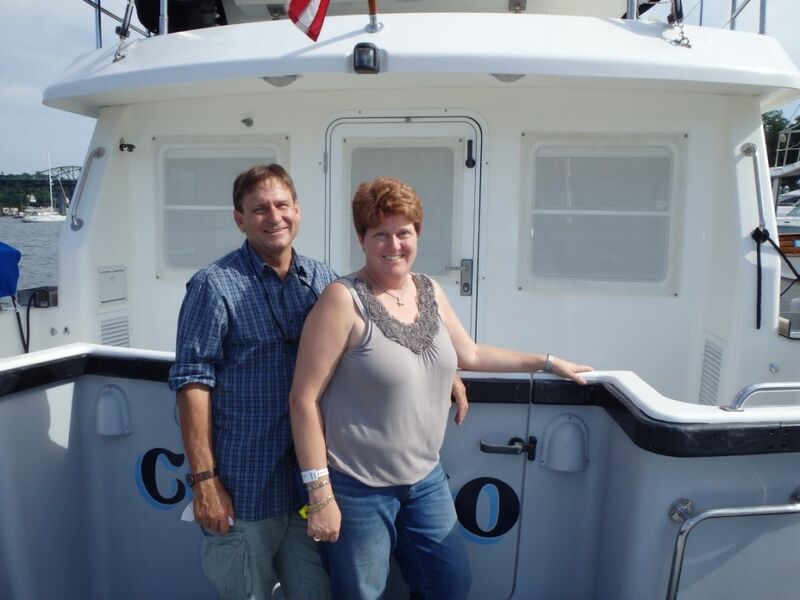 Even though we were previous trawler owners, Jeff provided us with a plethora of information regarding cruising, safety equipment, maintenance suggestions, etc. Jeff was also very helpful in assisting us with the complete purchase process including recommending and arranging the marine and engine surveys, a captain to help relocate the boat, attorney to process the paperwork, etc. After the purchase was complete, Jeff came out on the boat with us and pointed out many things with our new Nordhavn that would have taken us much longer to discover on our own. Jeff is extremely competent and knowledgeable, but more importantly is also now a friend and a pleasure to know. My name is Jeff Johansen and this summer my wife, Denise and I realized a dream come true by becoming the proud owners of N40-49, to be named Passage III. We were ably assisted in this endeavour by Jeff Merrill from your office. But this simple sentence does not begin to describe the help provided by Jeff that has allowed us to be “living the dream”. I thought that I would drop you a line to make you aware of the extraordinary effort from Jeff and to thank PAE for making our dream a reality. 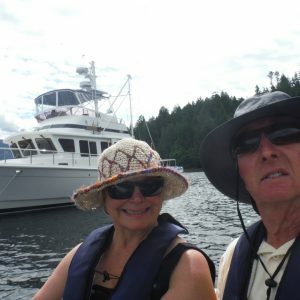 We live just outside Vancouver, Canada and I grew up on and around boats. 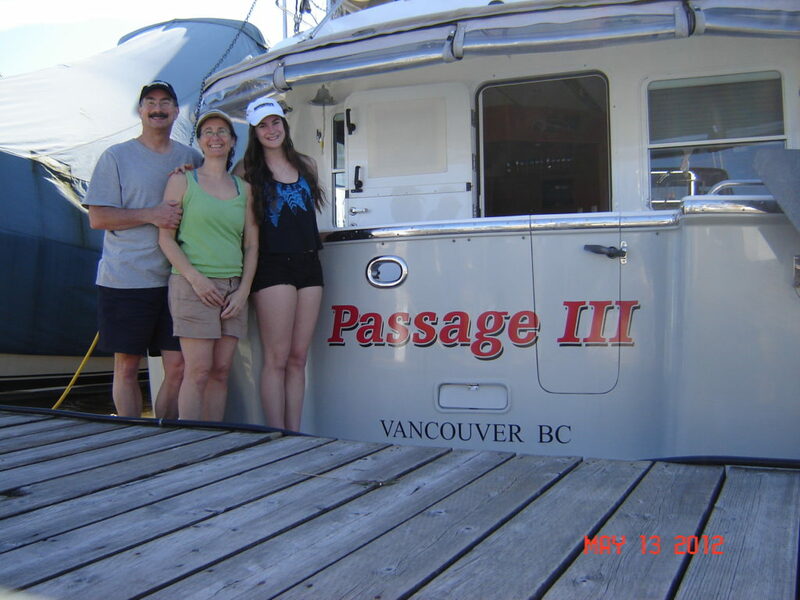 From the age of six I spent my summers on the family cabin cruiser plying the waters between Vancouver and Desolation Sound. Being an ex Navy man, my Dad would take our little 22 foot Sturdy Craft into out-of-the-way places and often into weather and seas that we shouldn’t have been in. This was exhilarating for me and my siblings but not a lot of fun for Mom. My brother and I spent endless hours in the v-berth looking at Boating and Sea magazines, dreaming of a power boat that could better handle the conditions we sometimes faced in our little craft. Even at that early age we had a keen eye for more seaworthy, ‘trawler’ style boats and focussed much of our attention on the Grand Banks line of boats. The die was cast and the Grand Banks was the boat that we drooled over through many a boat show and magazine article. Years later (late 90’s) at a boat show in Seattle, my brother and I came across a 50 ft boat called a Nordhavn. As soon as we saw it, we knew this was something very special. I still vividly remember going aboard and every thing I saw and touched just oozed of quality and sturdiness. After that show I started looking for information on this Nordhavn brand. I found articles in several magazines, particularly Passagemaker Magazine. I read with great interest the Passagemaker articles about the PAE development of a 40 ft model. Later, my brother and I made a special trip to Seattle to see N40-1 that was offered for sale by another broker. 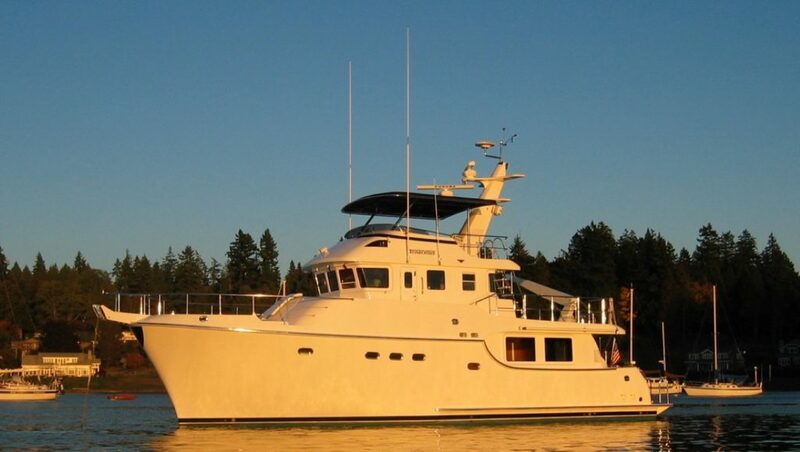 Although out of the question at that time, the Nordhavn 40 became my new dream boat. I read everything I could find on Nordhavns, PAE, and voyaging under power. I would only go to boat shows where I could see Nordhavns so I could learn more about them. At a Trawler Fest show in Poulsbo, Washington, my Dad, brother and I met Jeff Merrill. He was extremely helpful and knowledgeable and answered all of our questions. Even though none of us were in the market for a new boat at the time, Jeff took the time to show us all the features that make a Nordhavn a Nordhavn. That was 8 years ago!! Since then Jeff has kept in touch through email, mail correspondence and phone calls. My wife and I would catch up with him at annual boat shows and he always treated us like family. He never pressured us or tried for a big sell job. But he always took the time to meet with us and to keep us up to date on the new Nordhavn developments. We received Christmas cards, brochures, updates and other valuable information from him over the years. When our financial situation reached the point where we could look towards a new boat purchase, I initially worked with 2 other local brokers. I thought that it was not practical to have a California based broker for such a major purchase. But I had been spoiled by Jeff’s previous assistance. These other brokers simply did not deliver on my expectations. So I contacted Jeff and explained the situation. He was not upset that I had “experimented” with other brokers and he got down to business to find us a boat. We worked with Jeff for 6-8 months, investigating and making offers on several Nordhavns. It was exciting and discouraging at the same time. Jeff kept it all positive and was tireless in his efforts to find the right boat. 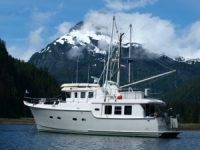 Eventually we stretched our range and looked at a newer, more expensive boat that was for sale in Kodiak, Alaska of all places! The price was higher than we were comfortable with and the logistics of taking delivery of a boat in Kodiak were almost overwhelming. I kept telling Jeff that Kodiak was closer to Russia than Canada! Jeff stayed positive and systematically explained all the steps and challenges that we needed to consider and with his experience (and numerous lists!) he built up our confidence to give it a shot. The negotiations took place over many weeks. The parties were not coming together and we had pretty much given up. I even told Jeff to withdraw our last offer. But Jeff didn’t quit. He worked behind the scenes and eventually worked out a deal that was agreeable to all and the papers were signed. That was in March. The boat was shrink-wrapped in icy Alaska. 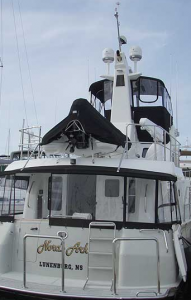 Jeff negotiated a prolonged closing period because of the season and to account for moorage and insurance issues. We scheduled a viewing, sea trial and survey for May when things were a bit warmer. Jeff committed a week of his time to assist us with the sea trial and closing. He flew pretty much directly from a holiday in the Bahamas to Kodiak. What a contrast that must have been! During that week Jeff tirelessly helped us become familiar with the boat and its systems. His experience with the boat was invaluable and he provided us with many helpful tips (and more lists) that would assist us in bringing the boat home. He worked well with the surveyor and the 4 of us had many good discussions over dinner. Through it all Jeff was very professional and deftly bridged issues between us and the seller as to what items were to remain on board. During the sea trial Jeff had me run the boat through several exercises to help me gain familiarity with how it handled in tight quarters. He knew that the next time I would be on board we would be heading across the Gulf of Alaska so he wanted to impart as much knowledge as he could. What was an enjoyable yet stressful time was made all the more comfortable with Jeff’s help and experience. He was tireless for the entire week and thought of so many important things that I had never even considered. In the end we signed off on the final subjects with smiles all around. In early July I flew back to Kodiak with my brother and a friend to deliver the boat. Jeff was on the phone or email checking in and providing helpful advice right up to the time we left the dock. During the trip we kept in touch with Denise via Sat phone and Jeff kept in touch with Denise to find out how the trip was going and relayed advice on some of the little things that inevitably go wrong. Through the entire process Jeff was unbelievable with the time and efforts he provided to make this all happen. He was knowledgeable, professional and showed a genuine personal interest for me and my family. I would not hesitate to recommend him to anyone in the market for a boat, regardless of the brand or the location. Jeff can make it happen. We have had the boat home for about 4 weeks now and Jeff continues to stay in contact with us to see how things are going. He is happy to answer any questions we have or suggest places to get answers. I consider him not just our broker but a friend. If we are ever in the market for a bigger boat, although hard to imagine at this point, Jeff will be the guy we go to. No question. Thanks to Jeff and PAE, for helping us realize our dream. Jeff was right. As much as he contributed in that first six-year stretch, he really was just getting started. Over the next year and a half, Jeff sent us literally thousands of pictures and contributed hundreds of ideas on how to build, configure, and equip Dirona. He visited with us several times in Seattle to work through the details and went with us to the boat yard in Xiamen China where we spent days placing equipment and improving the details. Nearly 5 years later, Dirona has wound on 4,400 hours and has taken us north to Prince William Sound in Alaska, up the Columbia and Snake River systems to Idaho, south to California, across the Pacific to Hawaii, Palmyra, Fanning Island, the Marquesas Islands, the Tuamotus, the Society Islands, Beveridge Reef, Tonga, Fiji, Vanuatu, New Zealand and Australia. We never thought we would use Dirona this much or travel this far but, having done it, we actually feel we are just getting started. Rarely does a week go by without us commenting on some design feature or equipment choice that Jeff made and thinking how lucky we are. It’s been years since the sale but he stays in contact, still makes recommendations, and still collects ideas from our experience to contribute to future builds. The longer we own Dirona, the more we appreciate the details he has contributed. Jeff specializes in details, he knows Trawlers as well as anyone, and he is incredibly patient and never pushy. We really appreciate Jeff’s contribution to Dirona and helping us get this dream underway. My name is Ned Lambton (Lord Durham). 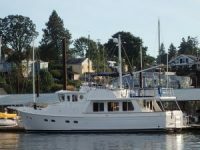 I recently purchased a used Nordhavn, hull 6231, from Jeff Merrill. I am very happy about the whole experience. I love the boats and the company and this represents the fulfillment of a long-held dream for me. I wanted to write to say what a really excellent fellow Jeff Merrill is. He was amusing, charming, efficient, informative and meticulous in his approach. He really went the extra mile for me. He wasn’t just pretending to care, like so many salesmen, he really did care, and now I consider him a friend. I am looking forward to many years of satisfying ownership. Thank you all for building these boats. It is a truly wonderful thing you have done, and unlike the great Captain Robert Beebe, I will not be drinking warm beer! I would like to offer our appreciation and thanks to Mr. Jeffrey Merrill for the excellent service he has given us. 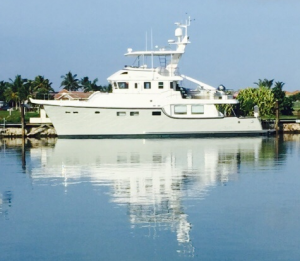 It started with us considering a used 2007 40’ Nordhavn in San Diego, to finally purchasing Nordhavn 43 hull 38 now known as Nora’s Ark. Jeff’s knowledge of the Nordhavn product is without a doubt, second to none. Jeff explained in great detail to us the options that were available. 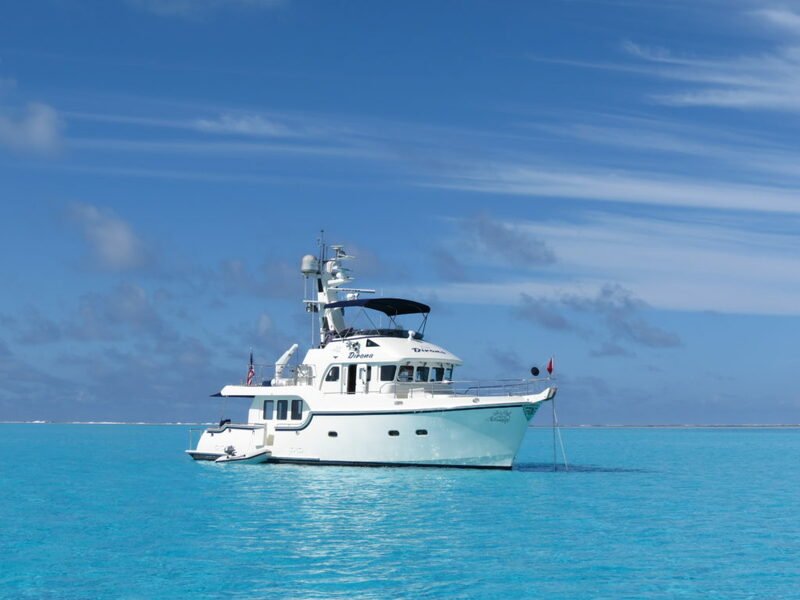 He explained to us several conceptual changes that other owners did to modify their vessels. He accomplished this with exceptional communication skills aided with pictures on CD’s and through e-mail. He made us aware of these facts in a timely manner which gave us the opportunity to add extras, not only niceties, but also safety items to our vessel in the production stage that would have been difficult or even impossible after the fact. Jeff walked us through the boat while it was still in Seattle, prior to the delivery, from stem to stern pointing out every detail to Nora and myself. This was critical for me, since there are some areas that my access is limited. So Nora has to have hands-on knowledge, especially in these areas. Jeff’s thoroughness accomplished this for us. We cannot say enough good things about Jeff, his knowledge and enthusiasm about this product way beyond reproach. Jeffrey Merrill is a gentleman, a professional and I believe a rue asset to any organization. Because of Jeff’s efforts I will certainly recommend Nordhavn and Jeff to all of my associates. Your impeccable ethics will have won you many loyal customers over the years, Penny & I are fortunate to be included. We also consider you and your family as friends – the ultimate in a business relationship! We wish you the ultimate success in your new venture & we will continue to refer potential clients to you. We met Jeff Merrill through an advertisement for a Nordhavn boat when we were exploring the possibility of moving from our blue water sailboat to a passage maker / trawler. One of the many excellent suggestions that Jeff put forth was to view as many different boats as possible and to attend boat shows and workshops. Because of that suggestion, we met Jeff face-to-face at the 2012 Anacortes Trawlerfest. Jeff assisted us with developing matrices to narrow our selection of potential vessels. Although our sights were set on a smaller style vessel, Jeff always made us feel that we were a very important customer. We have now attended two trawlerfests and several of Jeff’s seminars and other boat shows. We have met him in Seattle WA and Dana Point CA and have from the start considered him to be not only a wise, astute business adviser but a personal friend. Although last year our search with Jeff’s close surveillance lead to a non-Nordhavn vessel (another story) we are back again working with Jeff on sourcing our next vessel, a 40 or 50 something Nordhavn. 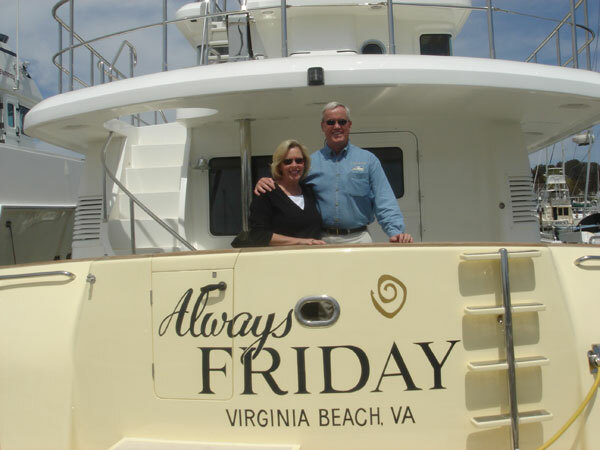 Jeff’s professional approach to the trawler brokerage business is impeccable. 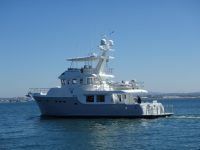 For this reason, we do not hesitate to recommend him to anyone looking to buy or sell a trawler. My wife and I recently purchased a used Nordhavn 43 through your boat brokerage office with Jeff Merrill as the sales rep for both the buyers (us) and seller. I wanted to let you know that we were very pleased and impressed with Jeff’s integrity, energy and dedication to all parties. He expended a tremendous amount of personal time and energy to get all aspects of the deal accomplished. 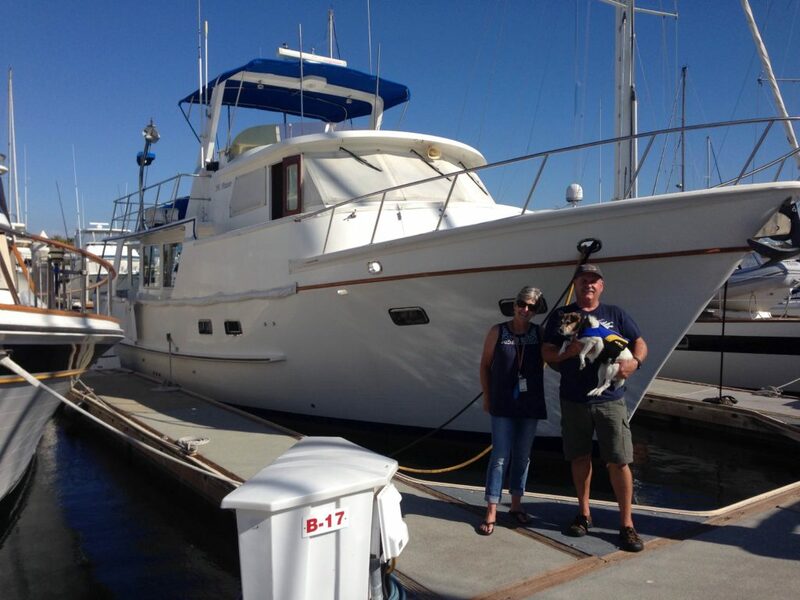 Of special note when the seller couldn’t find time to pilot the boat to the yard for haul out, Jeff and his wife took the boat from Long Beach to Newport Beach to get the haul out done so the survey could be completed on schedule. We found Jeff to be very open and honest with us and was very helpful every step along the way. He kept us well informed and made sure we understood the schedule for our activities and understood the process. I know most of what I mentioned above is considered part of his job, but my wife and I wanted to express that he did what he was supposed to do very well, and did it without being a “pushy salesman” and did it while at the same time showing great integrity, openness and honesty. We would not hesitate to steer anyone is his direction in the future. This is a letter to endorse my Boat Broker Jeff Merrill. 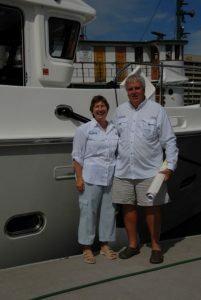 In November 2012, Jeff helped me locate, inspect, negotiate and purchase my 2005 Selene 55 Yacht. I have purchased many “high dollar” “high ticket” things in my life and I would like to say that I have NEVER experienced the professionalism, knowledge and expertise that Jeff has given me throughout the entire process. Not only did Jeff find me the perfect boat for my needs at the price I wanted to pay but he protected me from numerous mistakes and potential problems that would have been easy for a boat Buyer to make. 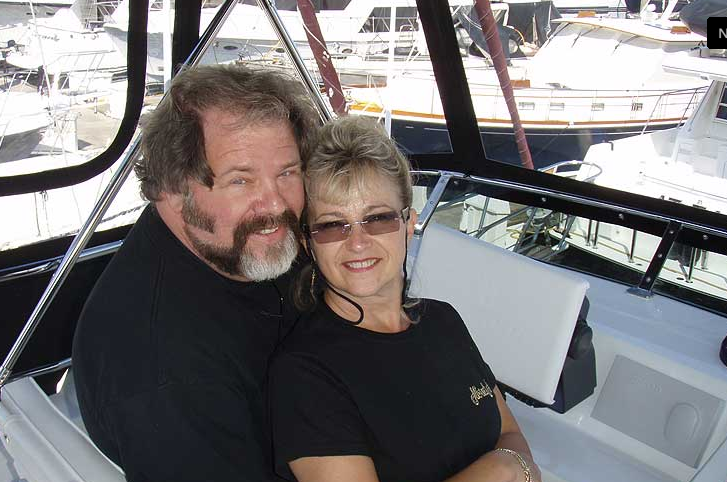 If I was ever to purchase another Yacht or had a friend or family member looking to do the same, I would ONLY consider recommending and using Mr. Merrill as your boat broker, he has made the entire experience fun, painless, enjoyable and has gone over and above the call of duty. 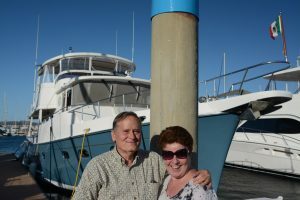 Kathy & I first met Jeff Merrill at the Nordhavn Commissioning Center when we drove from Virginia to Dana Point, CA to take delivery of our new Nordhavn 55 M/V ALWAYS FRIDAY. 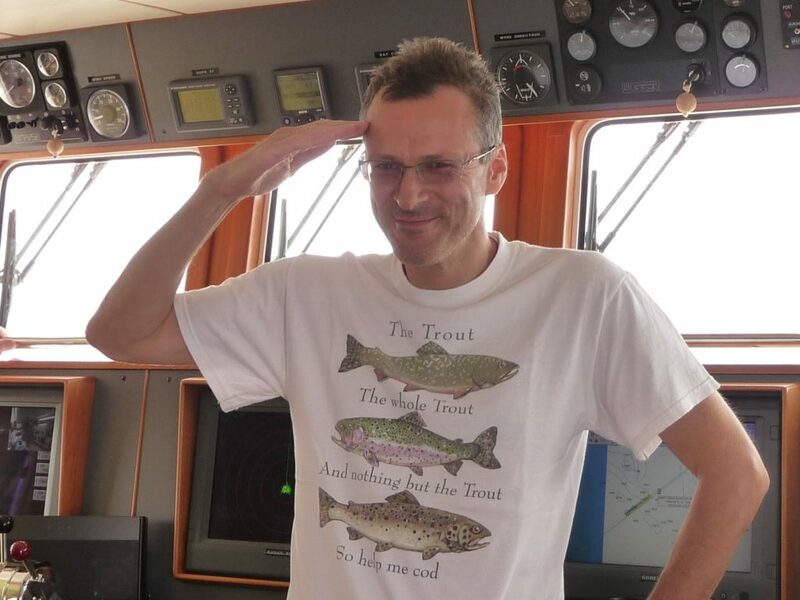 Jeff immediately and consistently demonstrated both his warm, cheerful personality and his very impressive knowledge of the trawler experience over the four weeks of commissioning of our new boat. He dedicated untold hours, both at the dock and at sea, in order to insure that we had an impressive command of the boat’s many systems that would be necessary to safely take our new boat over the 15-20,000 NM voyage that we had planned and studied for the preceding three years.By the day that we left Dana Point for Alaska, we were both very comfortable that we could handle any unexpected event that might come our way when we were far from civilization.Over the next fourteen months at sea, the boat performed beautifully, and the few times that mechanical, plumbing or electrical gremlins raised their heads, our knowledge gained from Jeff’s efforts proved perfectly adequate to take us safely from California to Alaska, then home to Virginia through the Panama Canal with stops in South America, the Caymans and multiple ports on the Atlantic seaboard.Many were the times when we recognized the value of Jeff’s extensive knowledge of the passage maker experience, as well as his dedication to the owners’ safety and enjoyment of the cruising experience.When the time came to sadly return to land based reality, Jeff was our choice to market the boat. Our confidence was rewarded by the sale of ALWAYS FRIDAY to another that sought the adventures at sea that we had enjoyed.Kathy & I can enthusiastically endorse Jeff as an extremely competent and effective professional broker who reflects the highest levels of ethics, honesty and integrity.If you seek Jeff’s advice on any aspect of passage maker yachts or coastal trawlers, you will not regret the experience!In fact, I am very sure that you will find that Jeff enhances every aspect of this great adventure! While researching Trawlers that would fit my idea of a dream boat, I also did a lot of research on boat brokers. One name that constantly popped up in glowing reviews was Jeff Merrill. 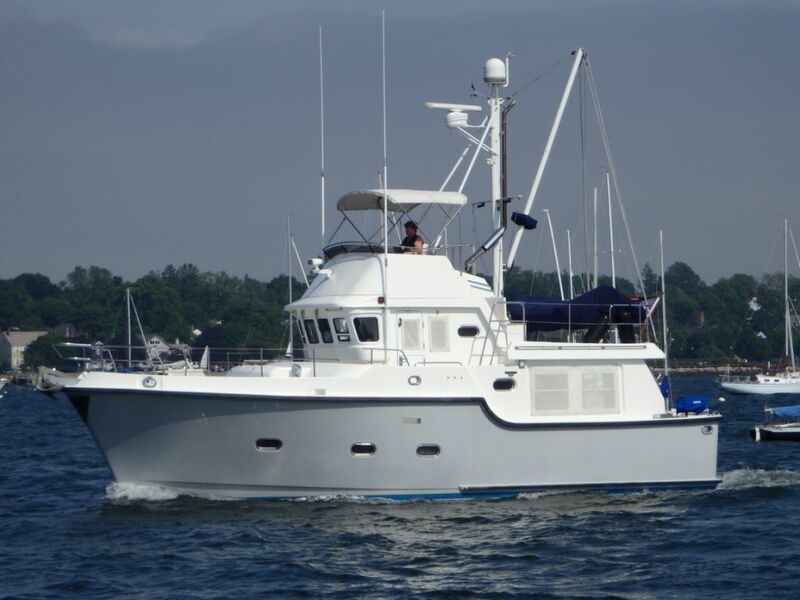 When the time rolled around to look at a Nordhavn trawler, Jeff was the first person I contacted and I could not be more pleased with that choice. Jeff did a great job during the purchase of my boat, providing outstanding documentation and photos of every nook and cranny on Sea Eagle. He also perfectly balanced the jobs of representing the seller and the buyer with the utmost honesty and professionalism. 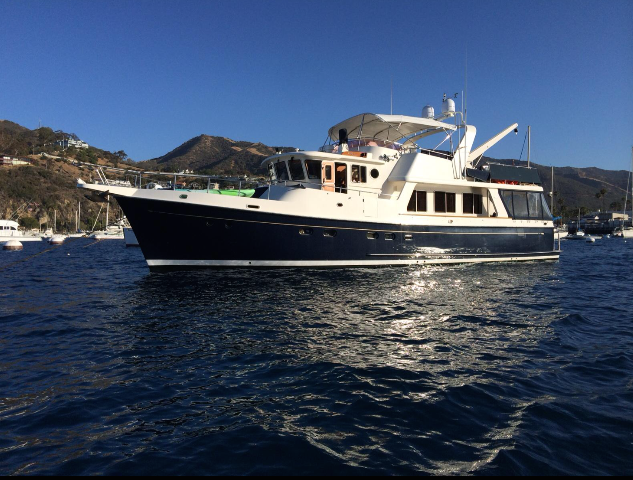 If you’re ever in the market for a Nordhavn or similar trawler, Jeff is the guy to talk to. His service before, during and after the sale have been awesome!